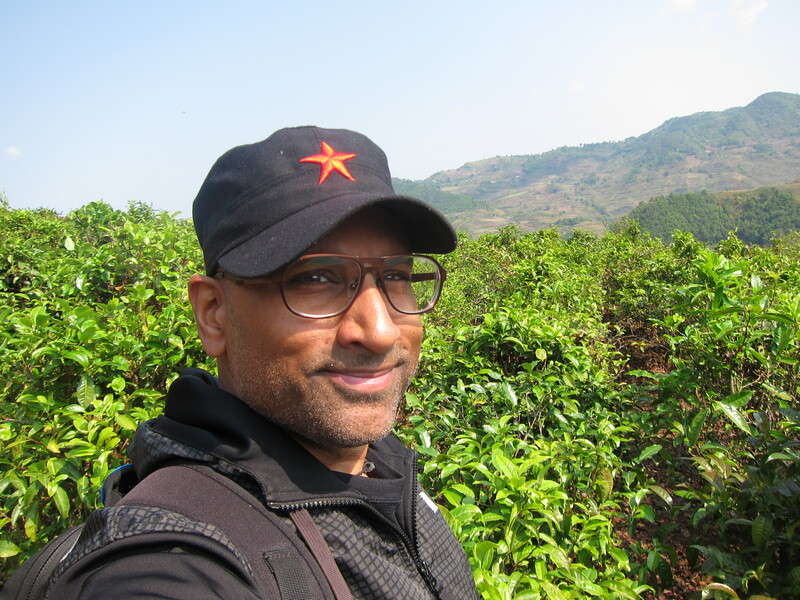 In a patch of cultivated tea bushes, Xishuangbanna. 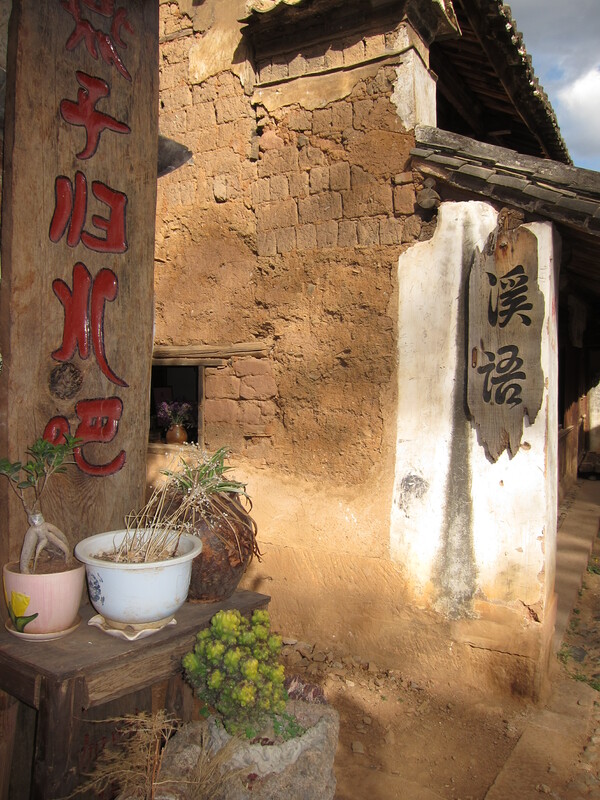 From Lijiang I decided to venture to the southern reaches of Yunnan near the Burmese border. 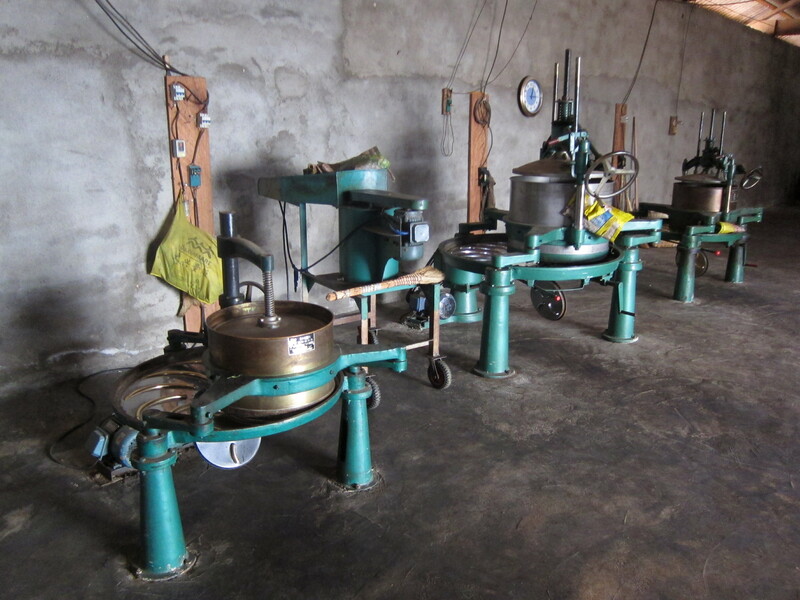 I was interested in seeing an area of southern Yunnan called Xishuangbanna, the center of tea production in Yunnan and the origin of the unusual Pu’er tea. 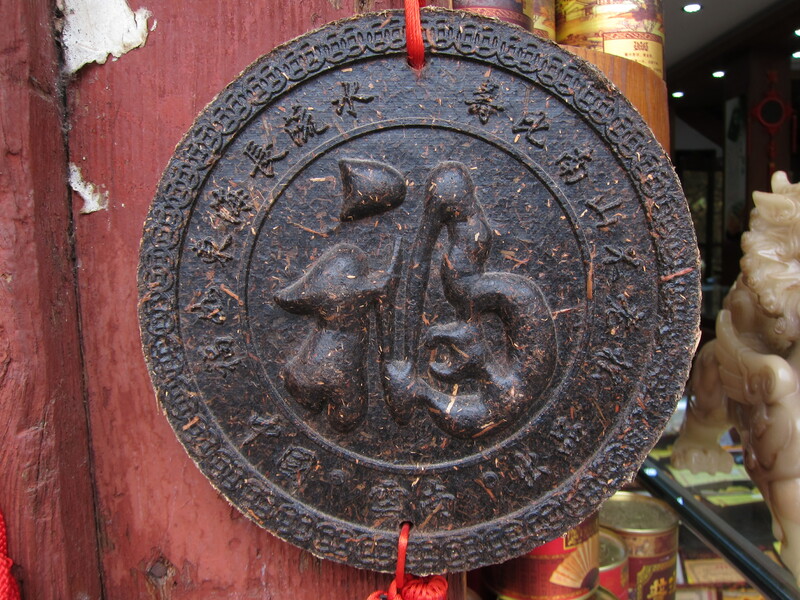 Also, according to historians, Xishuangbanna is probably the place where tea was first cultivated thousands of years ago. 500 year old wild tea tree. To get to Xishuangbanna, I had to suffer though two miserably long bus rides, broken by an overnight stop in Kunming. About four days ago I finally arrived in Jinghong, the major city in Xishuangbanna. 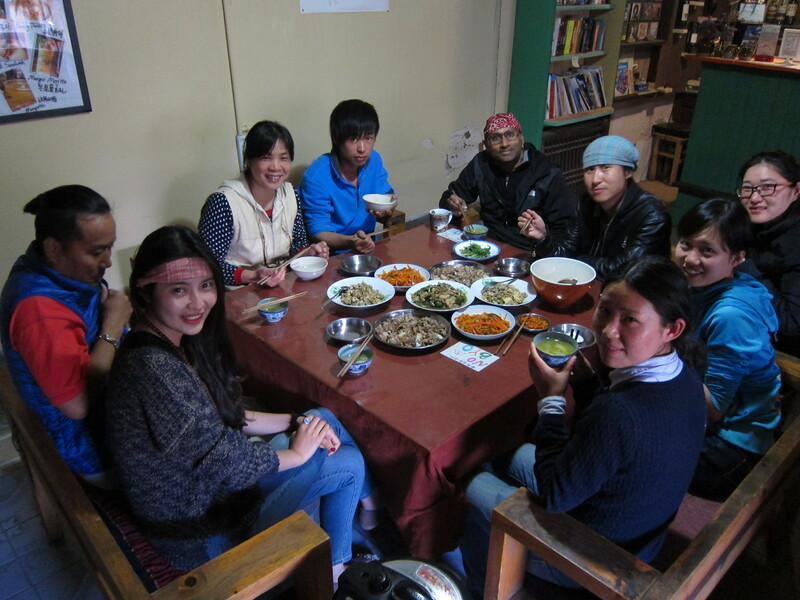 After a bit of investigation I connected with Sara, owner of the Forest Cafe trekking outfit in Jinghong. 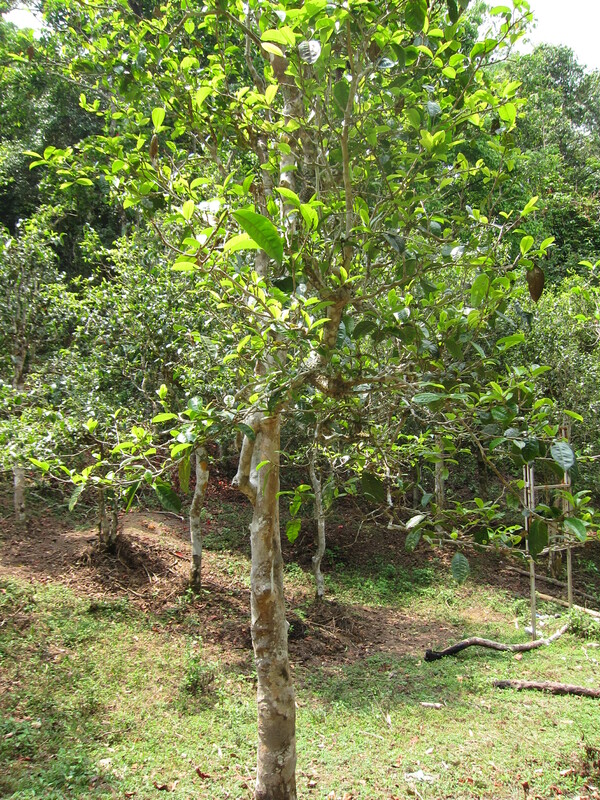 I told Sara I had heard about some ancient tea trees in Xishuangbanna and that I wanted to see some of these trees. 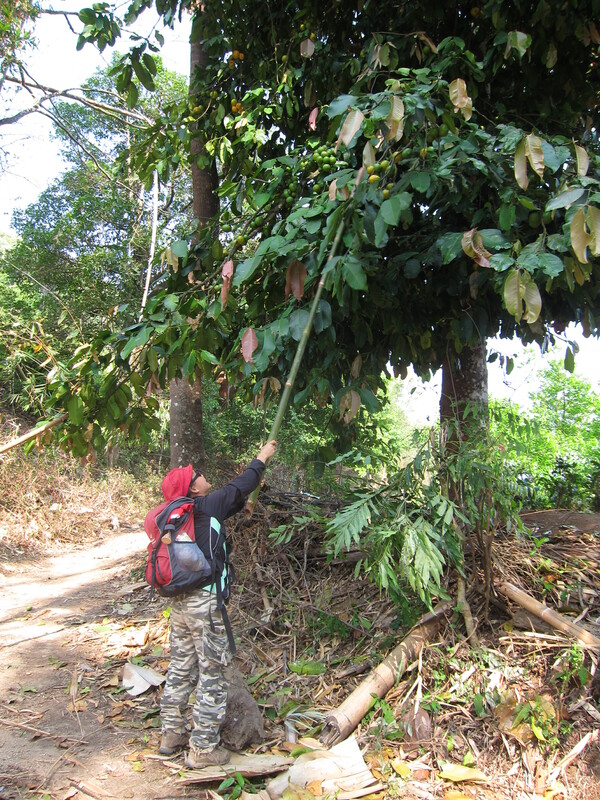 She arranged a two-day trek in which we walked through some ancient tea forests, stopped at a tea processing plant, and passed through some of the local villages. 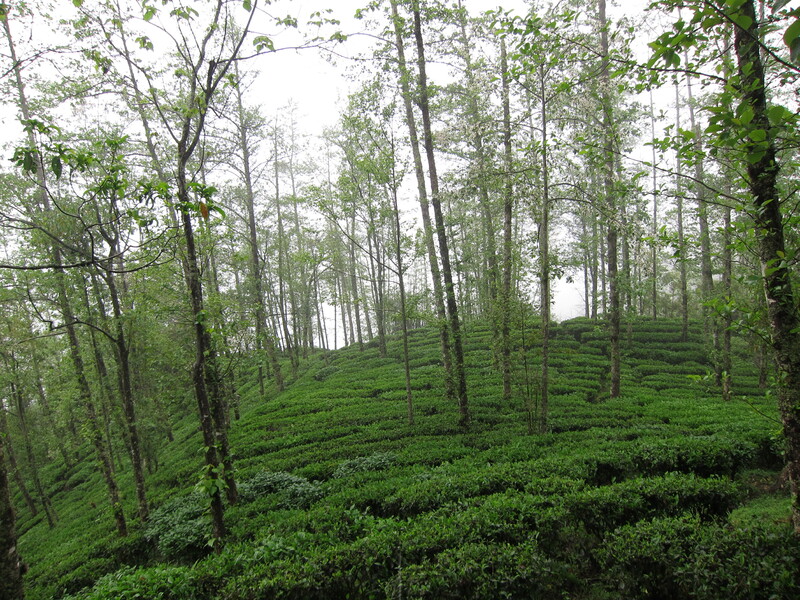 A whole forest of ancient tea trees! (Sara, our guide, is in the photo too). 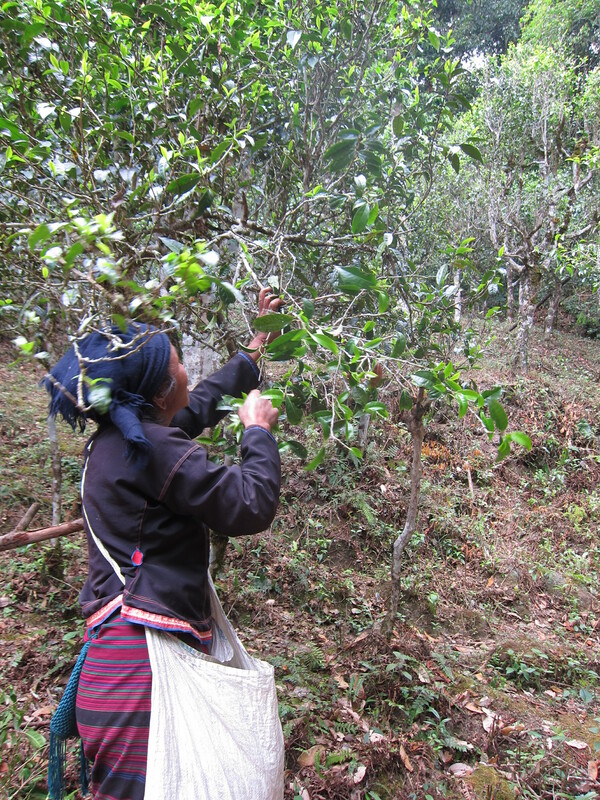 One of the tea pickers let us take her photo. 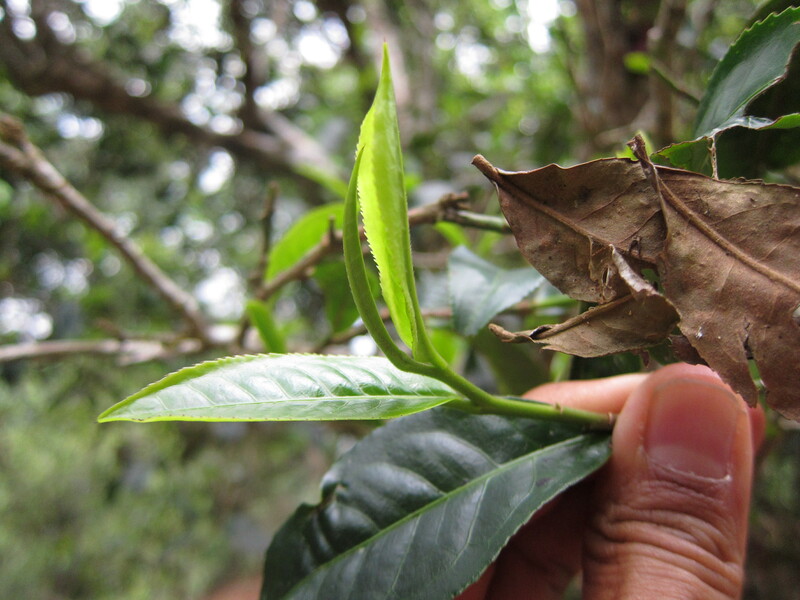 Usually two leaves and a bud are plucked together. 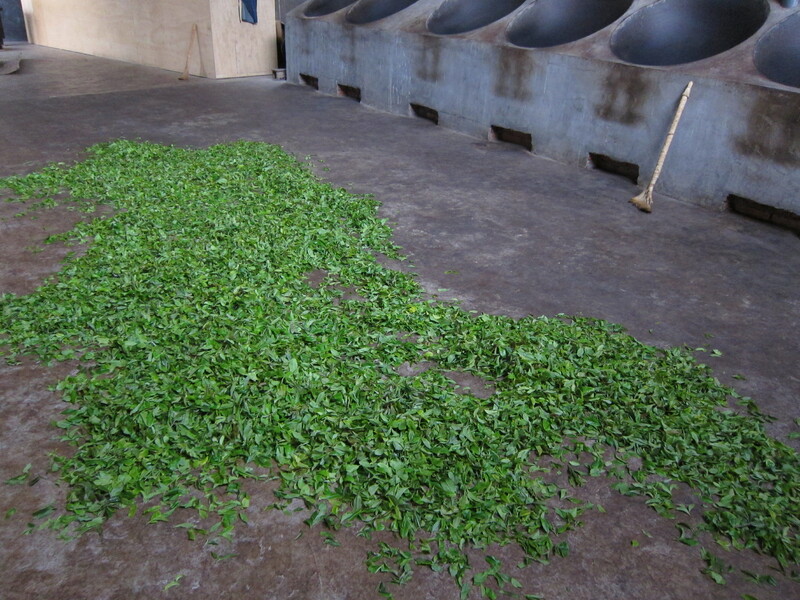 After they are picked, the tea leaves are left to wither a bit. 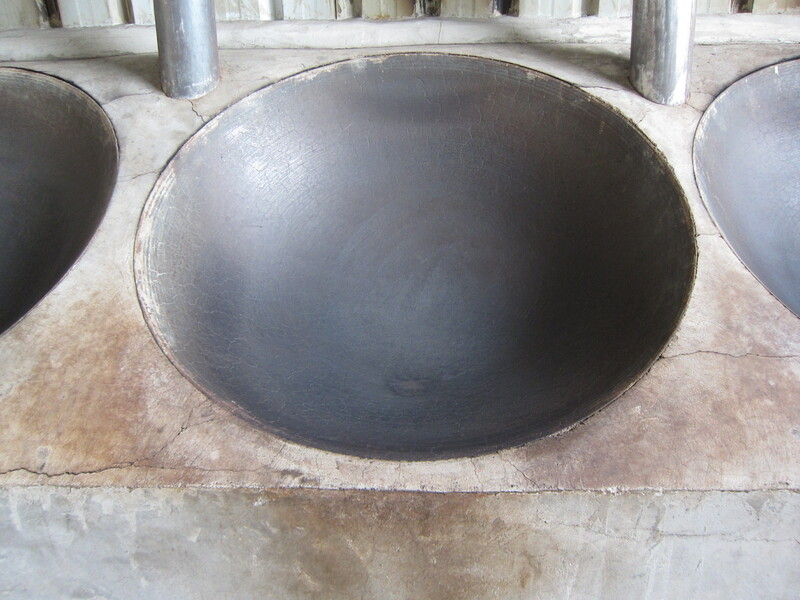 Then they are fried in big woks to stop the oxidation process. Finally the leaves are dried. Yesterday we set out in the morning and were joined by a Swedish woman, Lena, who was taking a break from her studies in Kunming. 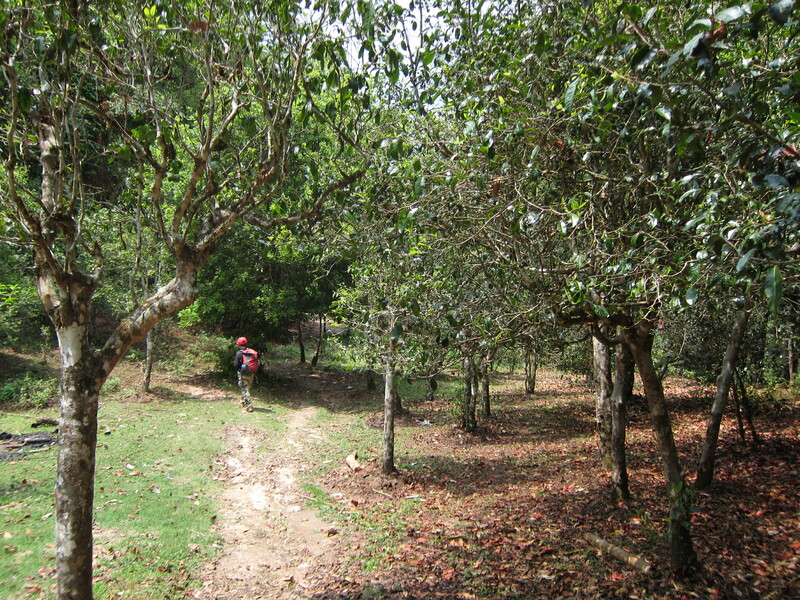 The mountain weather was very pleasant and as we walked along Sara made sure to point out some of the interesting flora and fauna in this area of tremendous biodiversity. 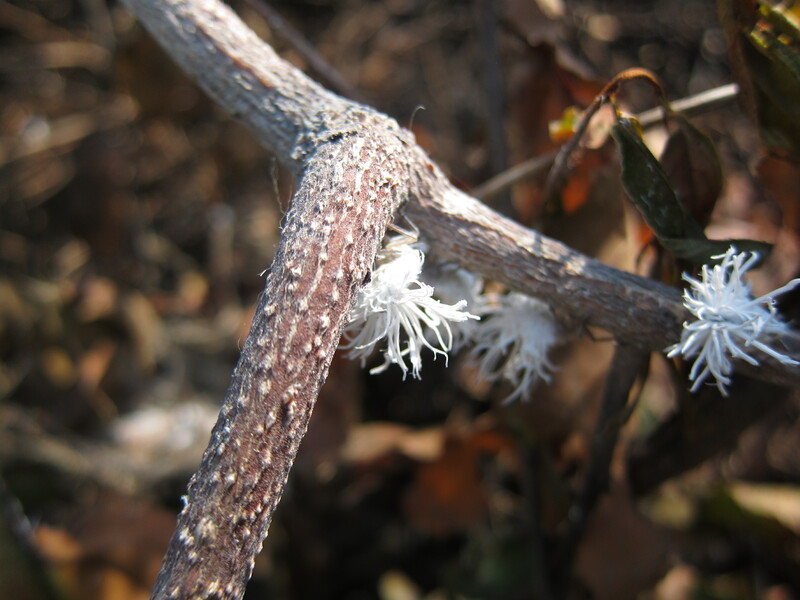 I thought this white thing was a flower, but it wasn’t! 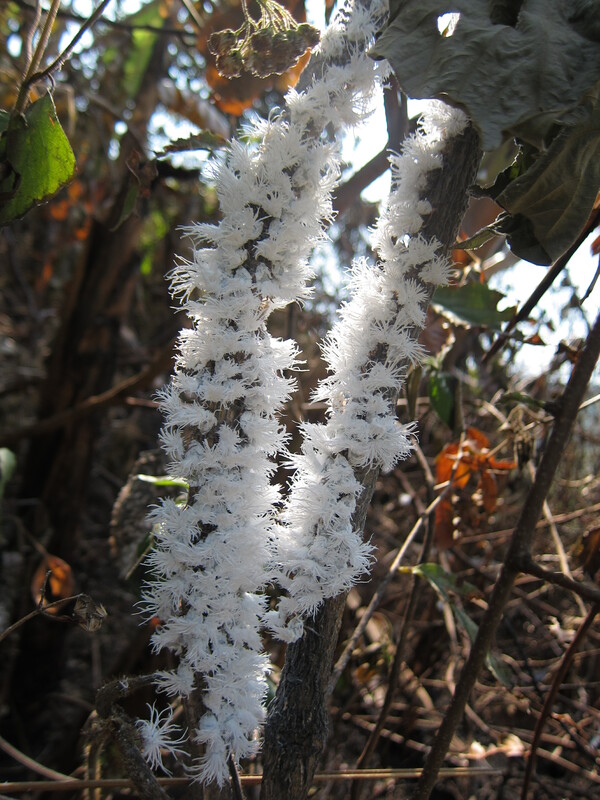 The “white flower” was actually a string of these tiny white insects! Sara managed to pull down one of these fruits. Tasted a bit like a mango, but very tart. Probably not ripe enough. 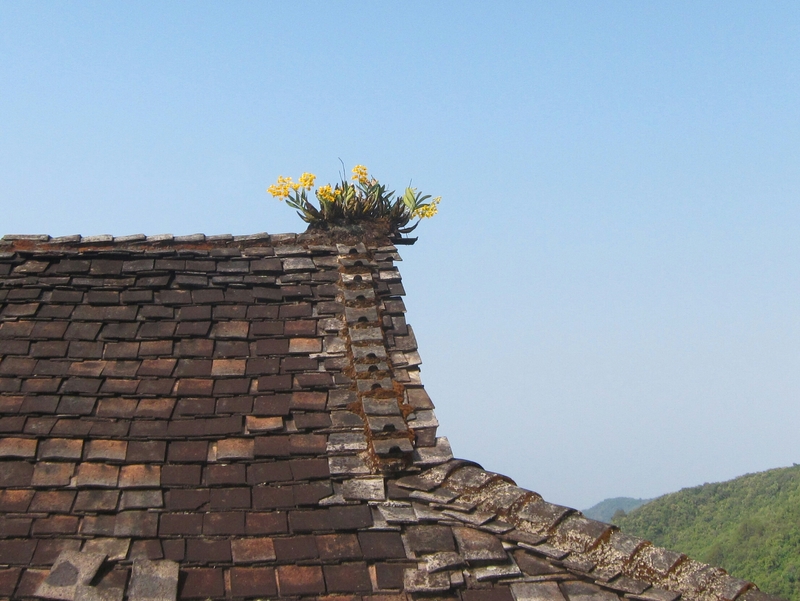 Growing orchids on the roof of this village home. 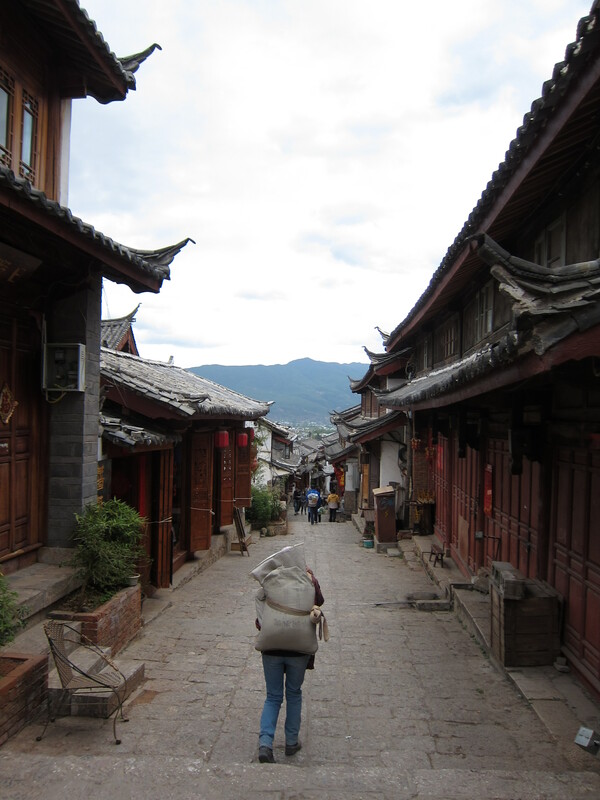 Yunnan also has an amazing amount of cultural diversity and is home to many of China’s ethnic minorities. 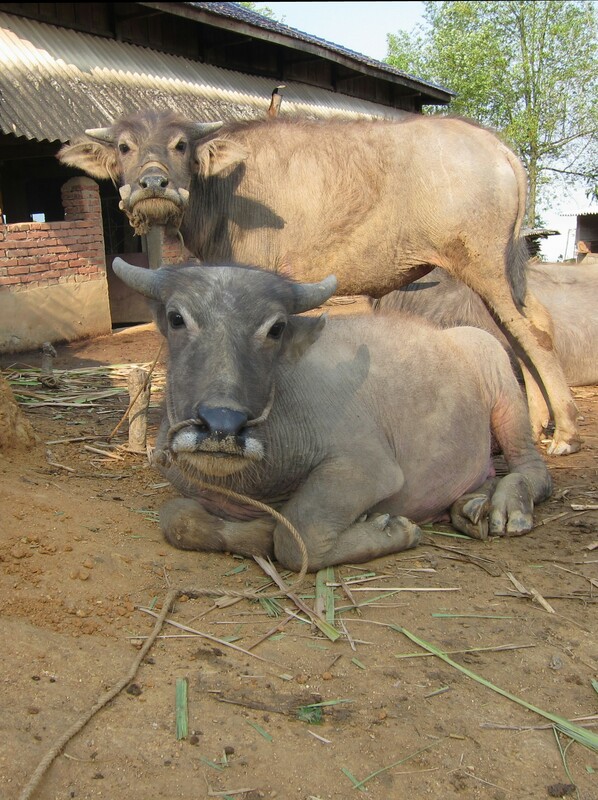 Xishuangbanna in particular has populations of Dai, Hani (and the subgroup Aini), Lisu, Yao, Jinuo, Bulang, Lahu and Wa, among others. We stayed the night in a Bulang village, in the home of a local family. This morning we resumed our trek through fields and forests, and walked for about five hours prior to returning to Jinghong in the evening. 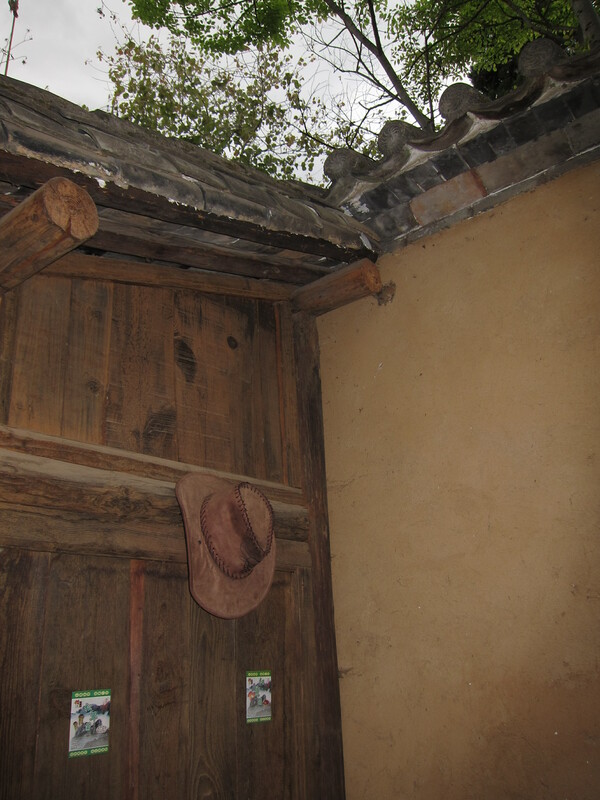 My horse needed a rest, so I stopped at the post in Shaxi. Met these guys on the trail. Many centuries ago, the Chinese wanted horses, which the Tibetans had; and the Tibetans wanted tea, which was grown in China; so over time a trade route was developed to rival the more northern route now referred to as the Silk Road. 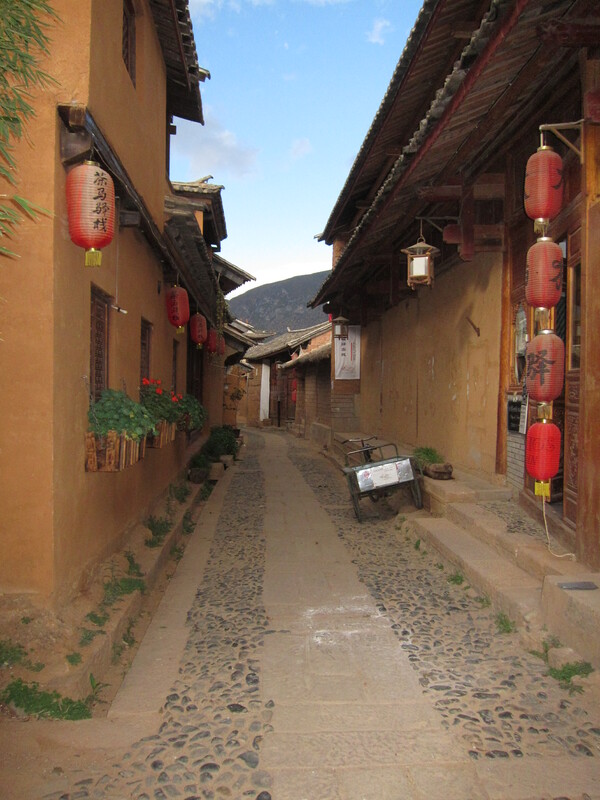 Shaxi is a fine place to hang your hat for a few days. 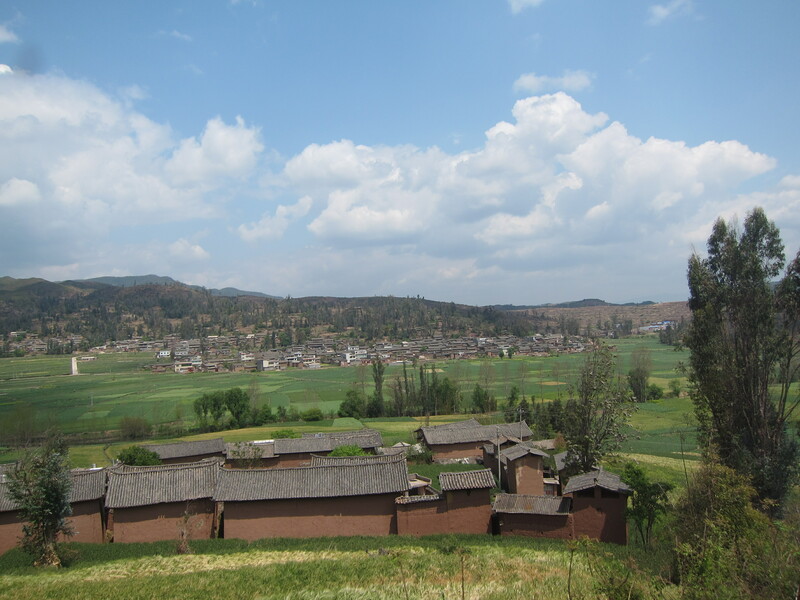 Shaxi (沙溪) is a tiny hamlet that was once a caravan stop on what some historians call the Tea-Horse trading route leading from China through Tibet and on into Burma and India. 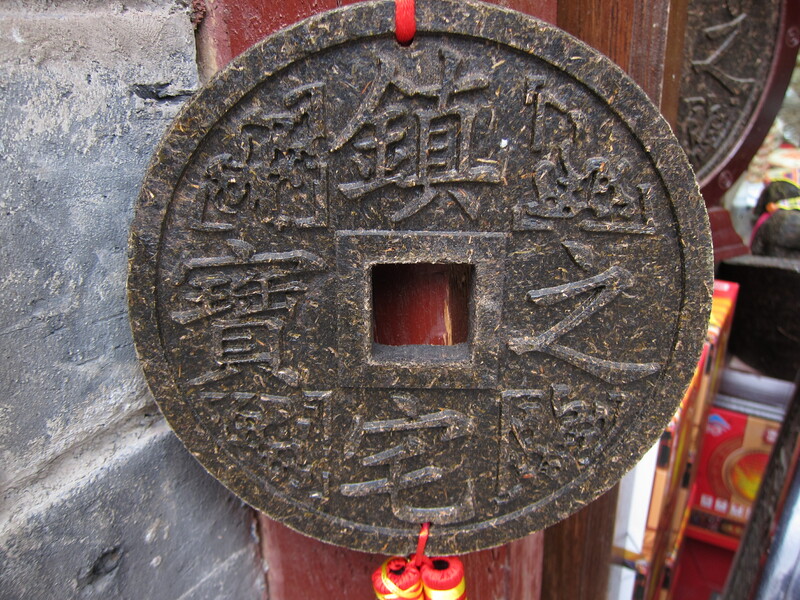 It began as a trading point for tea and horses during the Tang Dynasty (7th to 10th centuries). Today it is a historic market town that still has a vibrant Friday market and is considered to be the most intact of the old caravan towns. 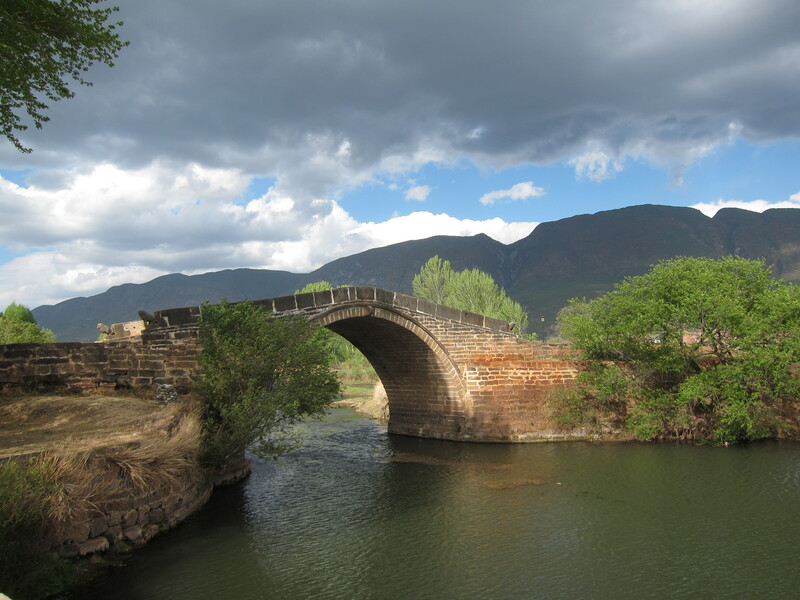 Shaxi was a breath of fresh air after Dali! 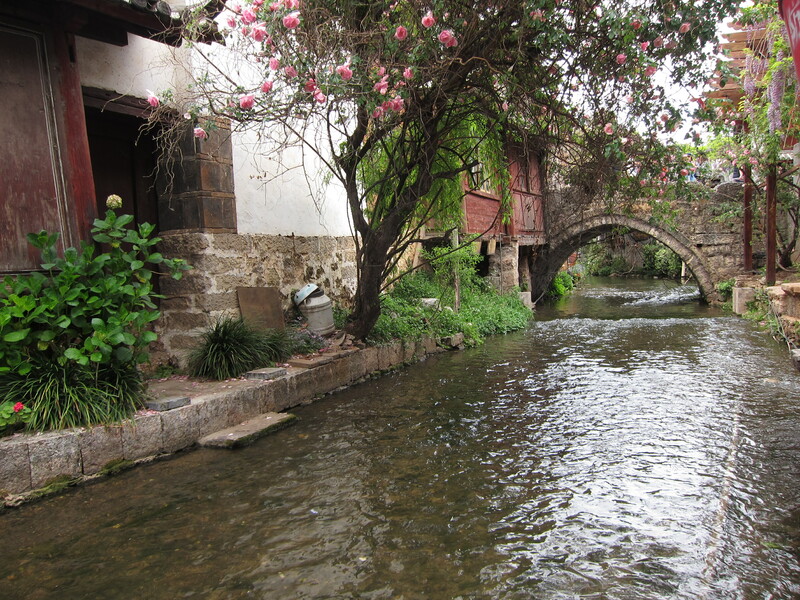 Not only was it much smaller but also it was without the throngs of tourists found in Dali. In fact, it had a sleepy, anachronistic feel, with few motor vehicles, several tea shops, and even a number of horses. 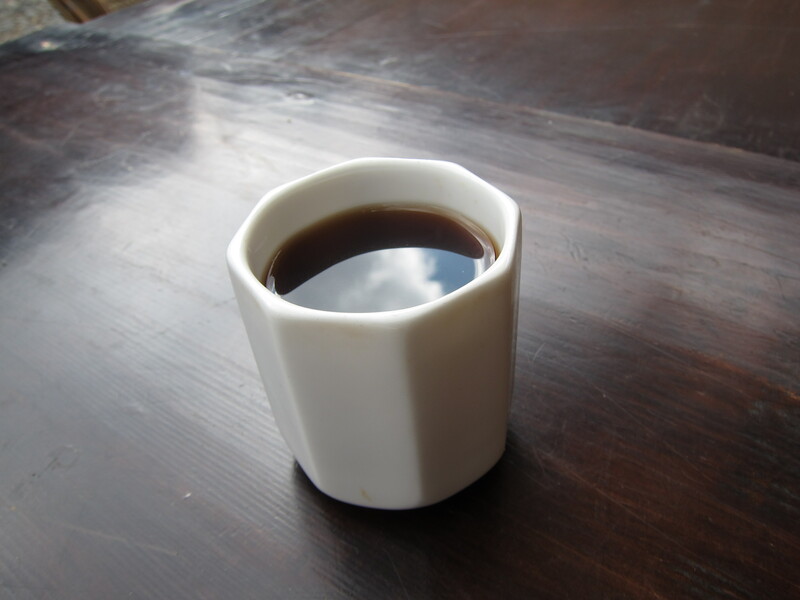 I found the sky in my Yunnan tea. My hostel, Horsepen 46, is on the left. My hostel, Horsepen 46, was indeed a converted horse stable! I enjoyed its peaceful courtyard and the nightly communal dinners for 20 元 – the young chef even cooked up some vegetarian fare for me. Dinner. nota bene: Brown dude in back does NOT speak Chinese! 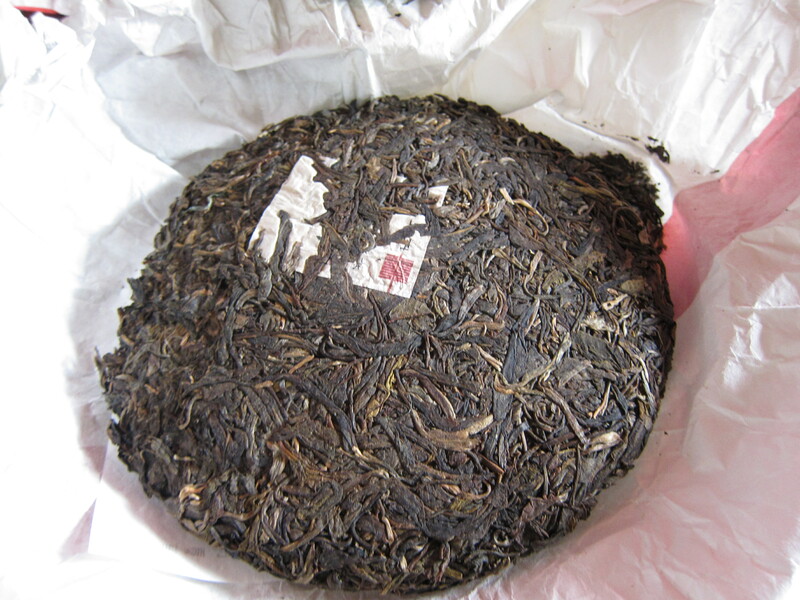 What we call black tea, the Chinese call “red tea.” The above is Chinese black tea: a Shou Pu’er tea. 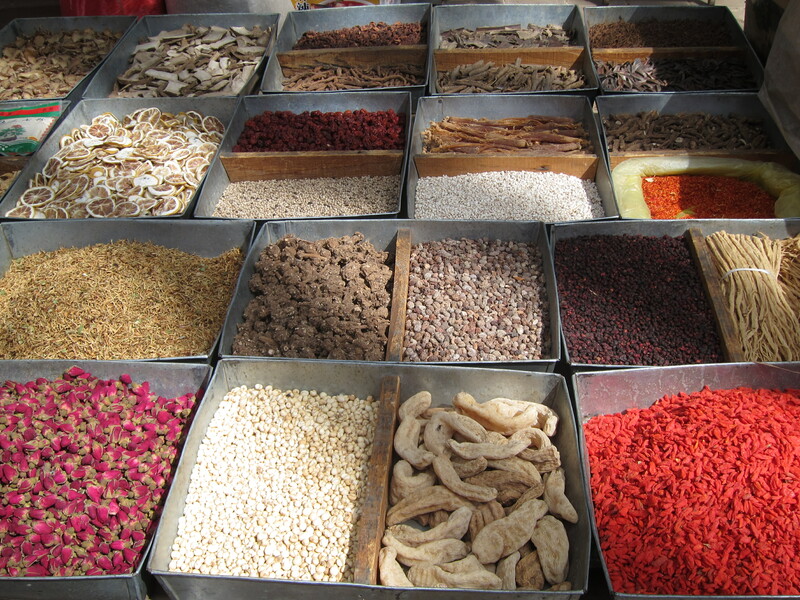 The Friday Market at Shaxi. Train ride from Kunming to Dali. In order to make sure I was getting on the right bus or train, I quickly learned how to read and write a few Chinese characters, which was easier than I thought, since the characters are ideograms. 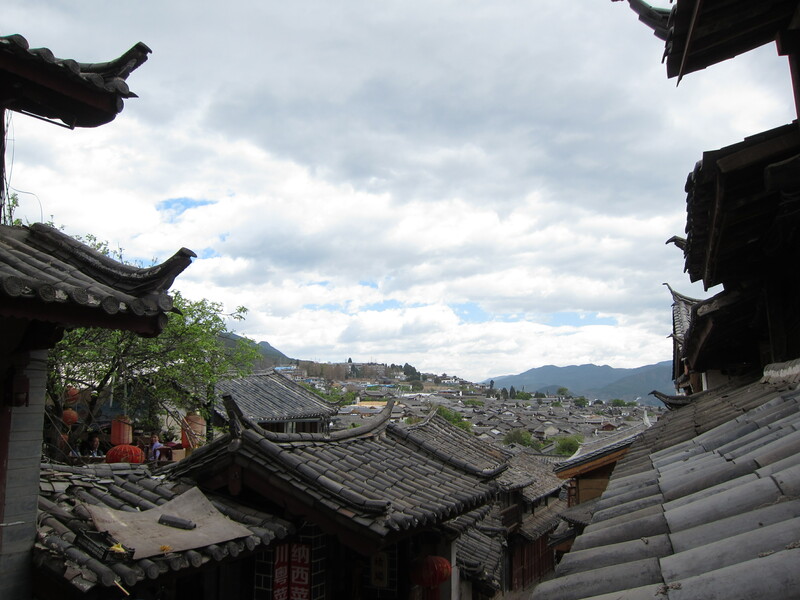 My next destination in Yunnan was Dali (大理) Old Town. I again boarded a train (火车; literally “fire car”) and in several hours arrived in the New Town of Dali, then took a local bus to the Old Town. 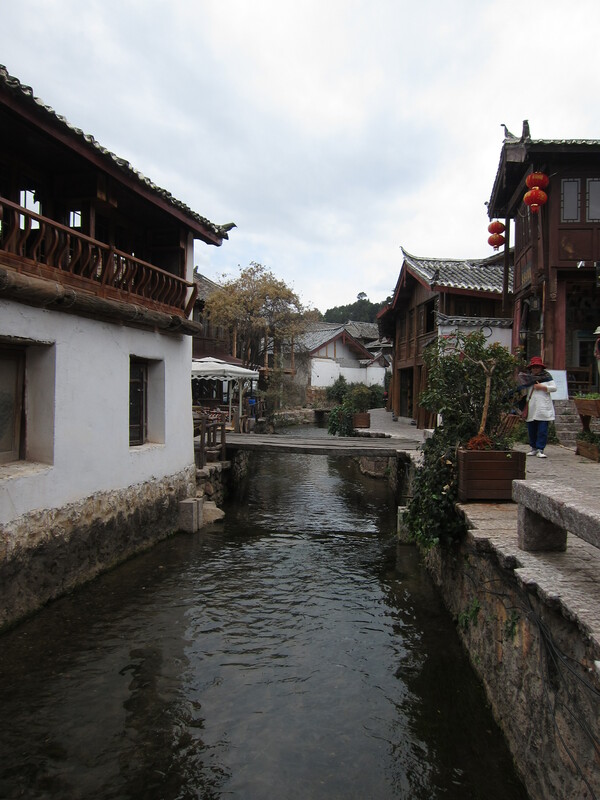 What is now known as the ancient or old city of Dali was built during the Ming Dynasty (14th century). However, the city’s origins can be traced several centuries earlier. Esthetically, Dali Old Town was not very authentic. It was clear that most of the buildings had been extensively renovated, and it seemed that in many cases the style of the renovations was not true to that of the original structure. 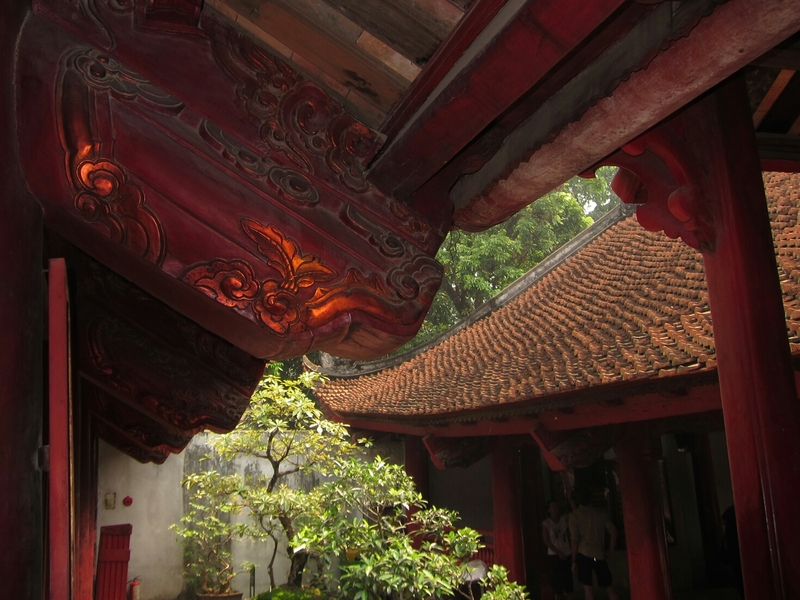 For example, I saw many buildings of poured concrete topped with a traditional style Chinese roof. I also noticed that the “slate tiles” often were not tiles at all but faux tiles that had been painted onto the concrete surface. It seems they grow a lot of blueberries near Dali. 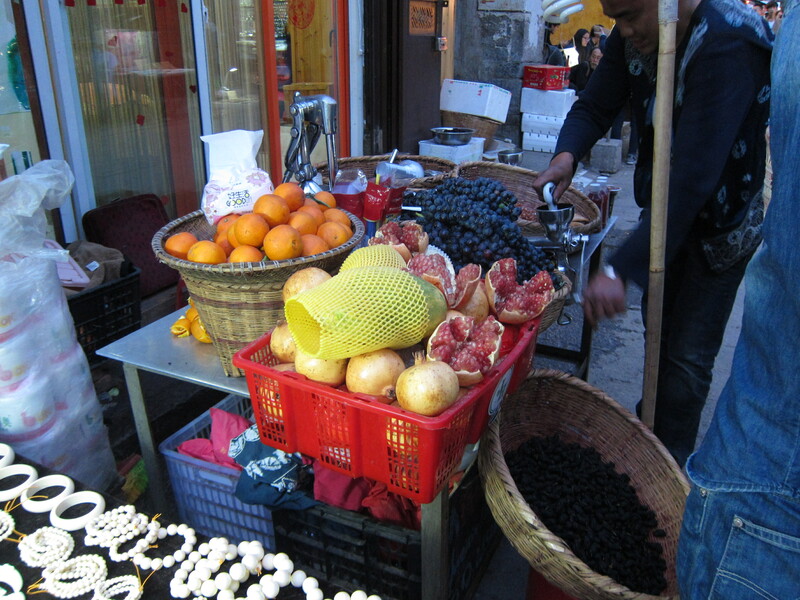 These little fruit stands were everywhere. The blueberry juice was tasty! Throngs of tourists, almost all of them Chinese, packed the main streets which were lined with souvenir shops as far as the eye could see. 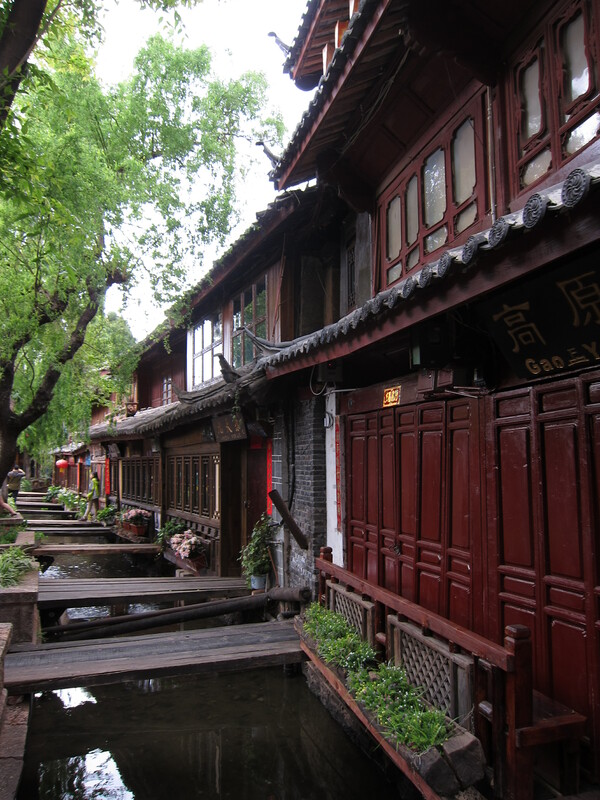 It was a Disney version of what was once an ancient Chinese town. 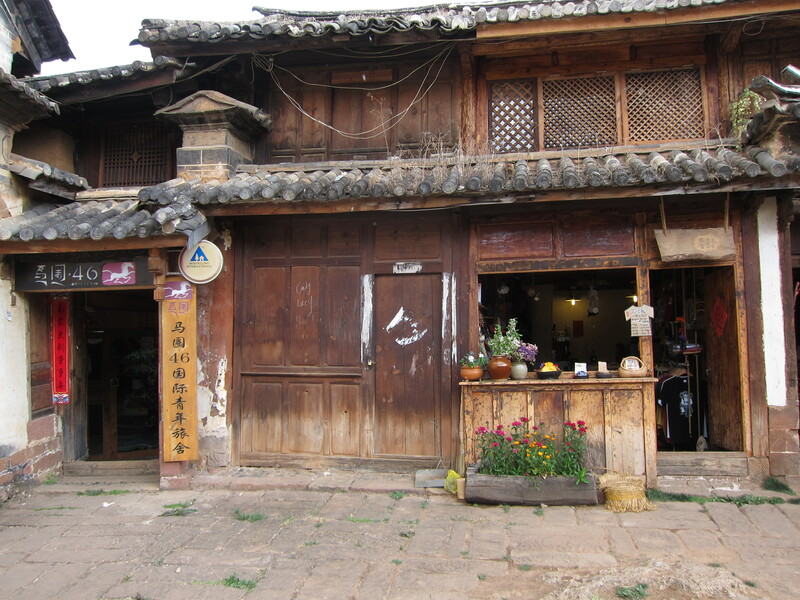 There were many tea (茶; pinyin Chá) stores selling various Yunnan teas: black (红茶), green (绿茶) and Pu’er (普洱茶). I wandered into a few of these shops but I thought that without speaking Chinese it would be difficult to negotiate a purchase. After I had browsed several tea shops, finally at one shop the sales woman started speaking to me in English. It turned out her English was very limited but sufficient for the circumstances, and I was able to practice my limited Chinese tea vocabulary. 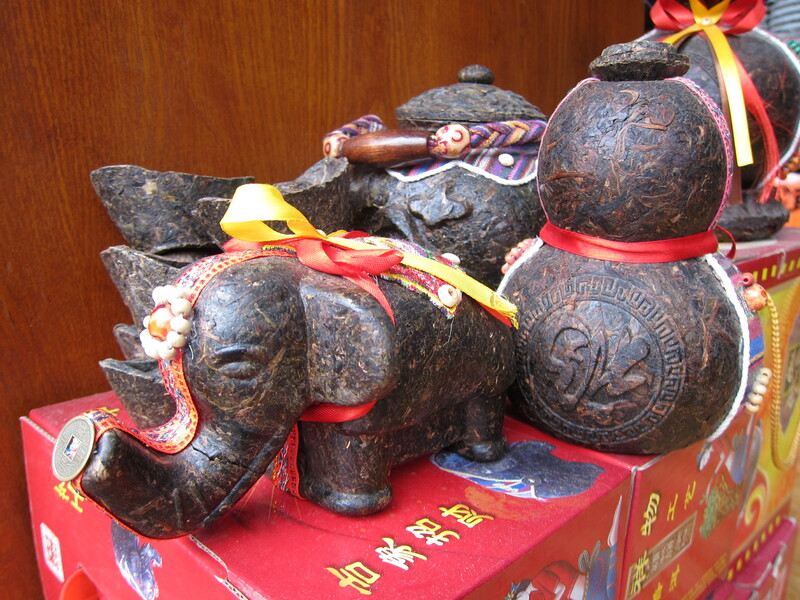 I paid 2 Yuan to have a cup of Pu’er tea prior to purchasing fifty grams of loose tea. In the tea shops I noted that they brewed tea in the traditional Gong Fu style in which a good quantity of leaves is steeped for only a few seconds in boiling water, and then re-steeped several times thereafter. One of the gates to the Old City of Dali. Green Lake Park in Kunming, Yunnan Province, China. Yesterday I crossed the border into China (中国; pinyin Zhōngguó, or “Middle Country”). 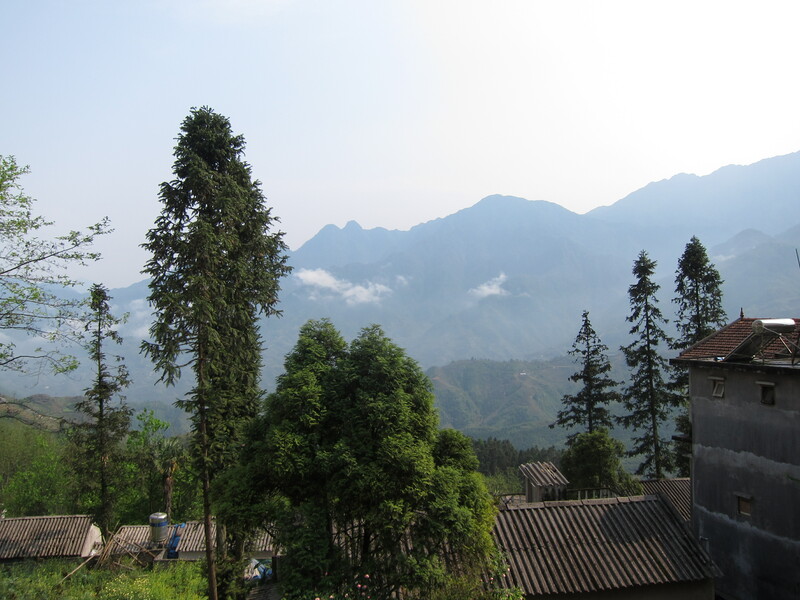 I first took a bus from Sapa to Lao Cai, Vietnam, then took a taxi to the border. I exited the Vietnam immigration checkpoint and crossed a short bridge on foot into China. Just as I arrived on the other side of the bridge a large Chinese tour group returning from Vietnam collectively got into the immigration line to enter China. Thankfully the line moved quickly, and anyway I realized that I would have to get used to large groups of Chinese people! 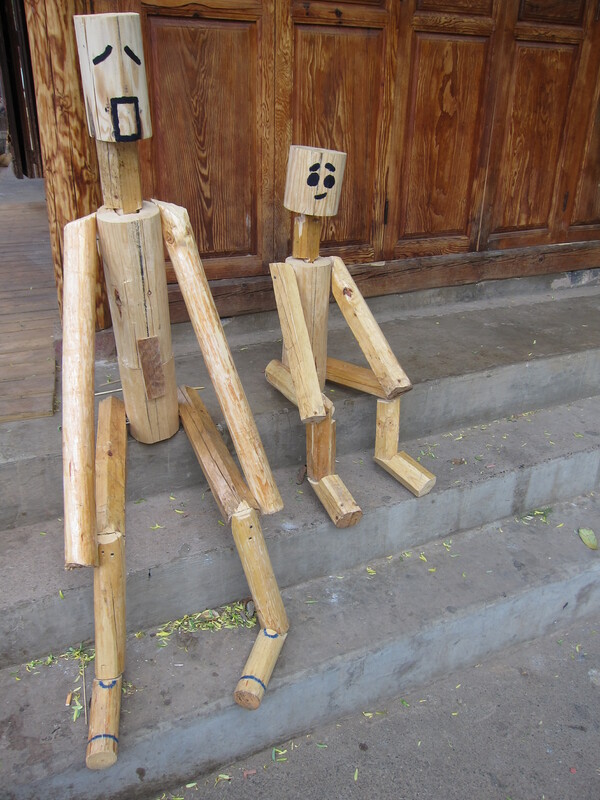 For some reason they seemed to be everywhere in China. 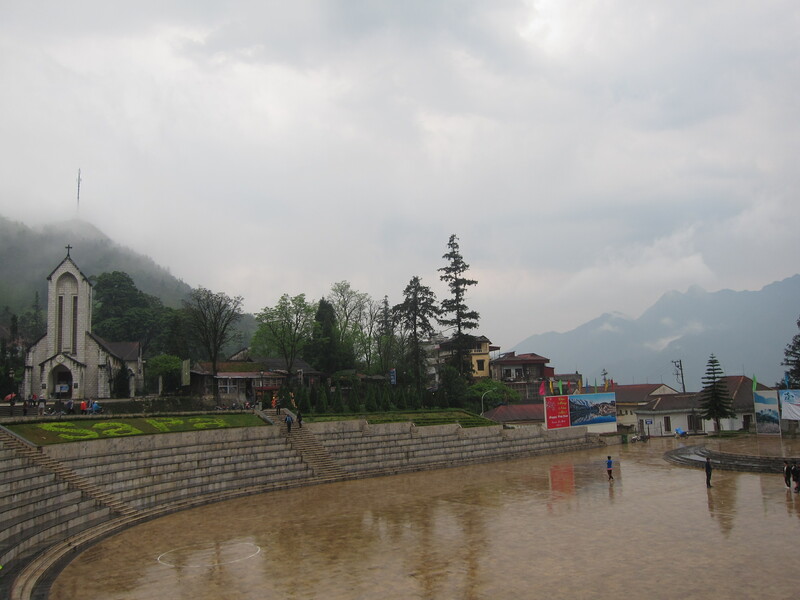 Hekou is the Chinese border town across from Lao Cai, Vietnam. After a few tries I found an ATM that would work with my card and I withdrew some Yuan. Next I stopped at a few mobile phone stores to inquire about a SIM card. Nobody spoke a word of English except for “SIM Card” so they understood what I wanted but indicated that they could not sell me a SIM card unless I had a Chinese ID. 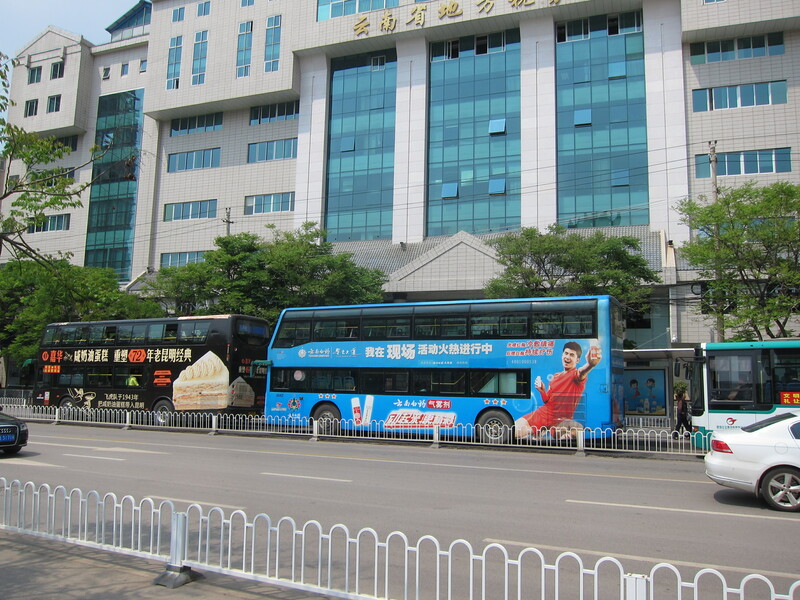 I found a taxi and went to the Hekou North train station where I caught a train for Kunming (昆明), the capital of Yunnan. 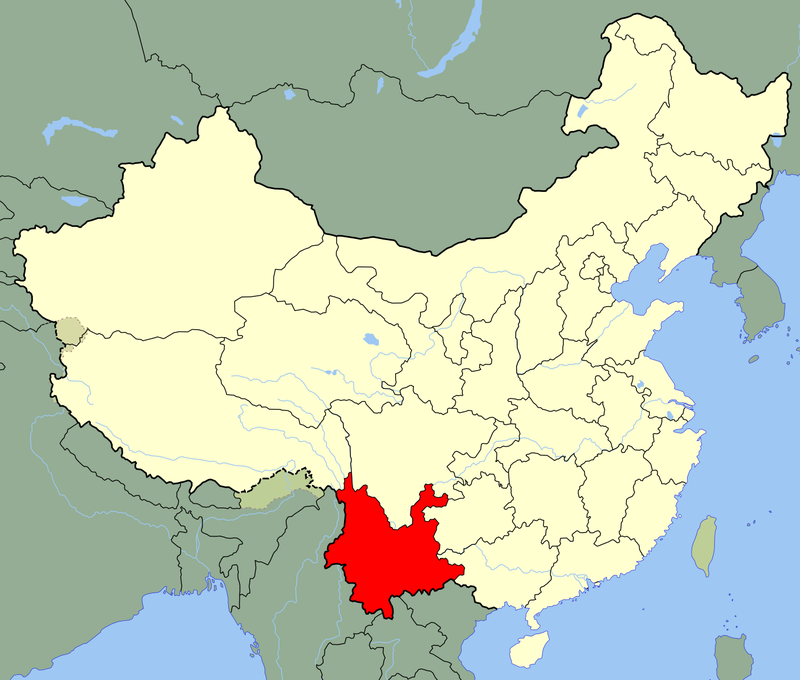 Public domain map of China, with Yunnan province highlighted in red. 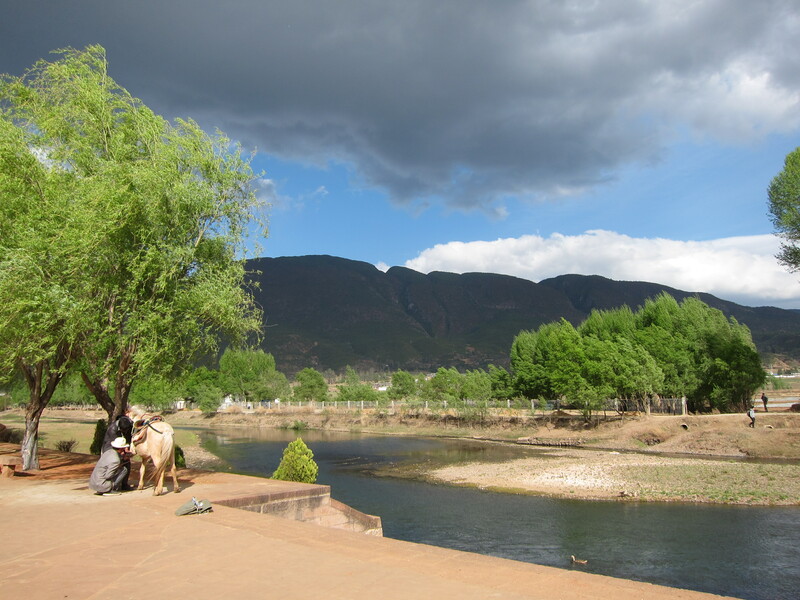 Bordering Yunnan, from left to right, are Burma, Laos and Vietnam. Hungry on the train, I bought some rice crackers. 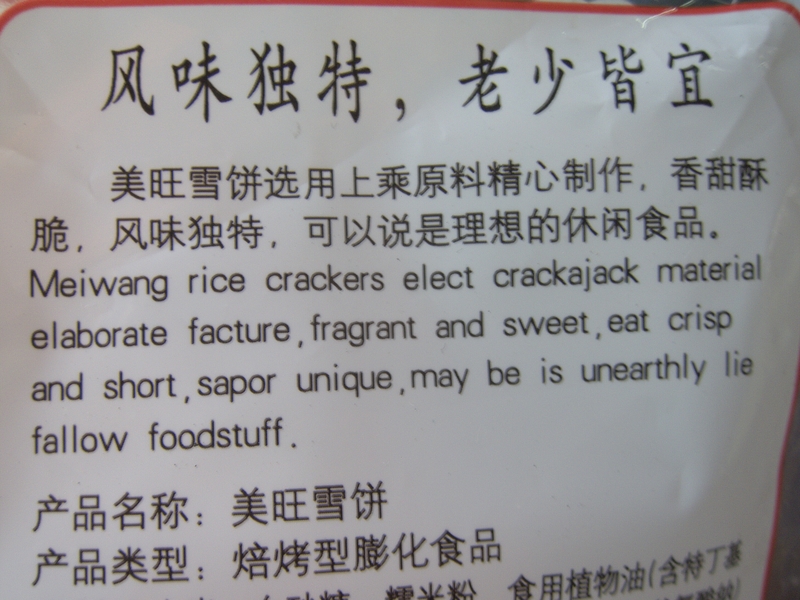 Thank heavens for the English explanation on the package! Now I know exactly what I ate. Unlike humans, the Earth does not acknowledge any political borders so the topography did not change as I crossed into China. 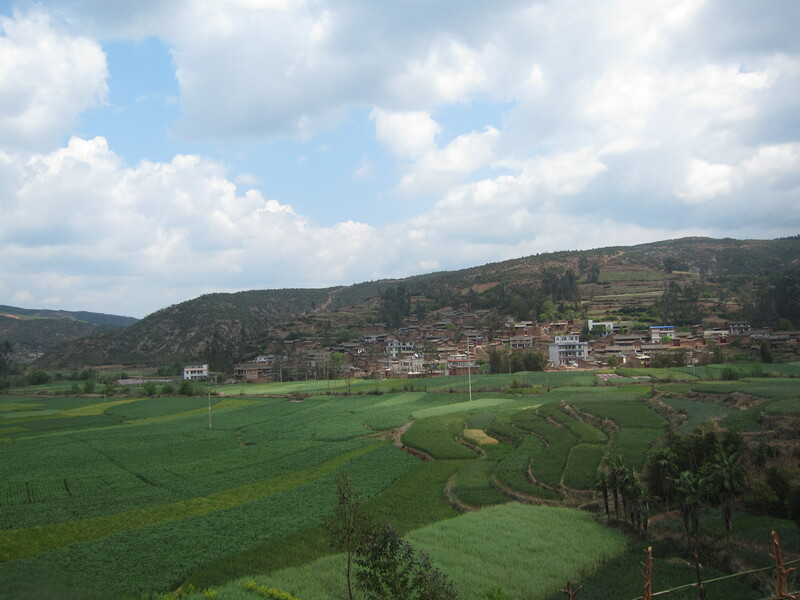 Yunnan, like northern Vietnam, is located in the remote foothills of the Himalayas. 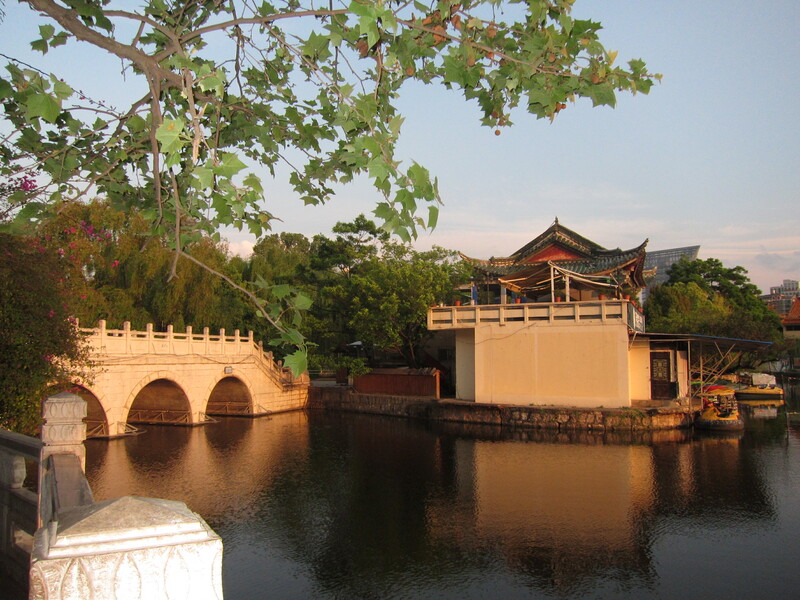 Kunming is reputed for its temperate climate year round, a benefit of its elevation. 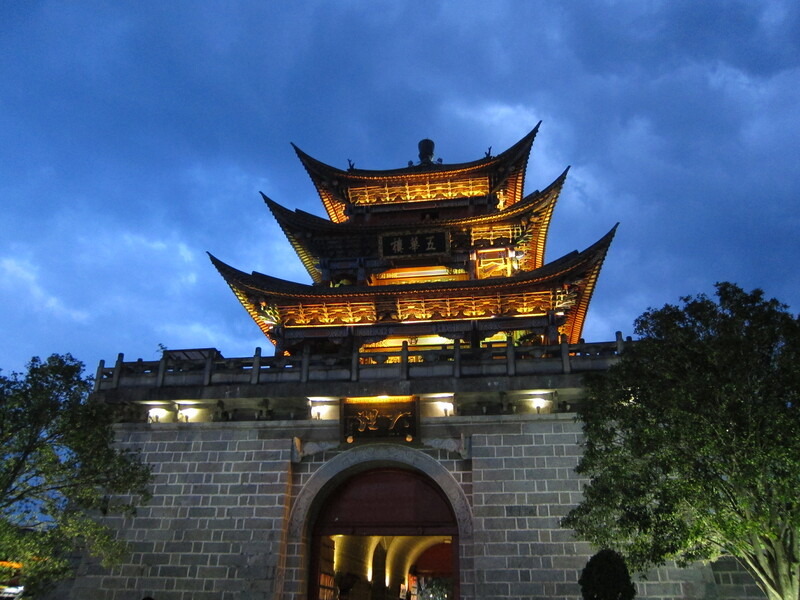 I arrived in Kunming near midnight, checked into my hotel and went to bed, tired from a long day of travel. Arriving in Kunming, I was not surprised to see a large number of construction cranes throughout the city, consistent with China’s unprecedented ongoing urbanization. With a population of over three million, it is a relatively large city, but I did not find it as crowded, polluted or dirty as many similarly sized cities I had visited in my travels. On the contrary, at least in the central area, I found an orderly, modern city full of gleaming new buildings, clean streets and pretty gardens. 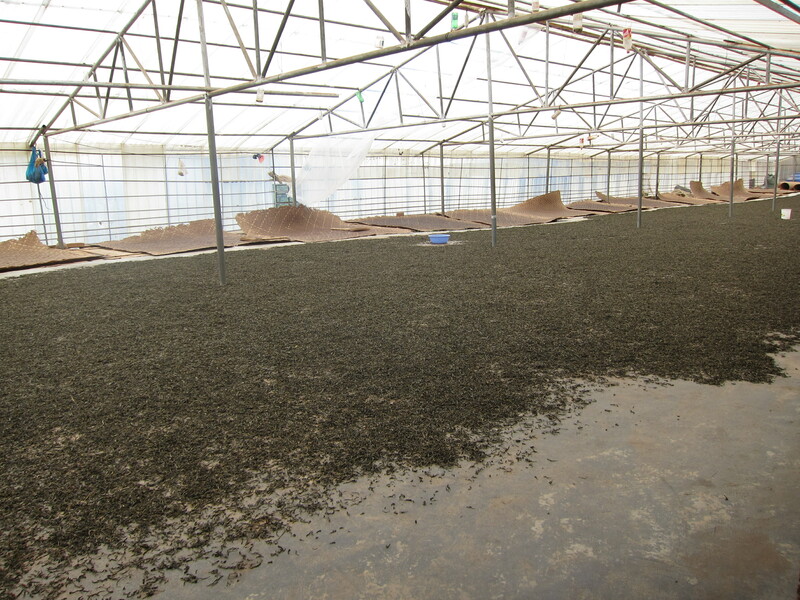 (The peripheral areas were not so pleasing, due to the massive construction projects). 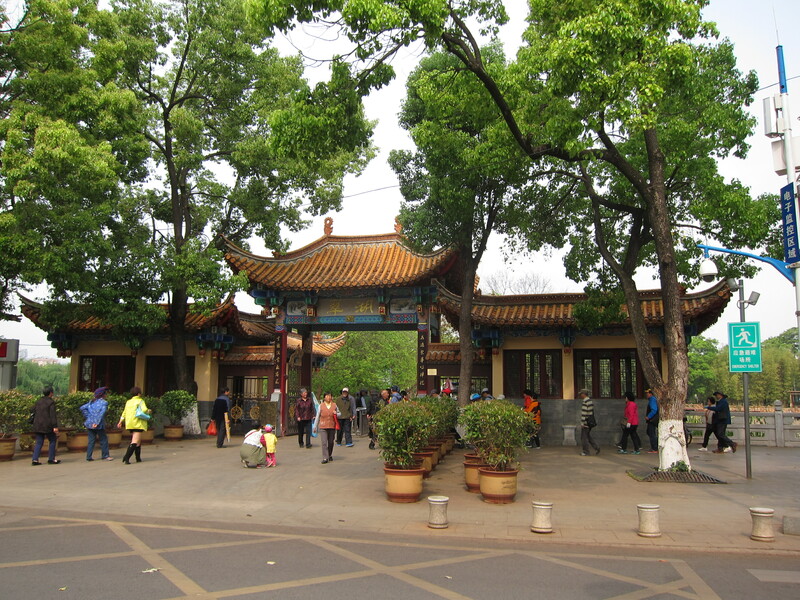 Entrance to Green Lake Park, Kunming. Today I explored Green Lake Park, the area adjacent to my hotel. 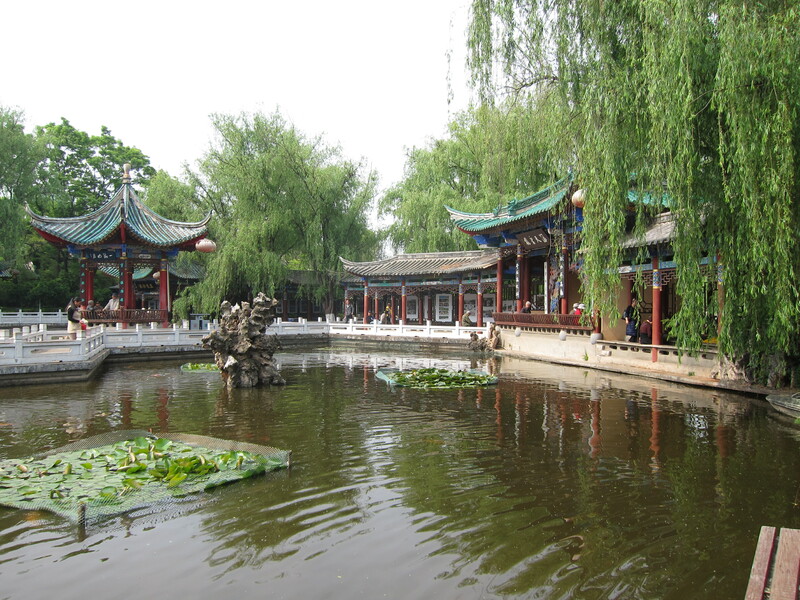 The little lake had walkways leading from the shore to a few tiny islands that had souvenir shops, cafes and well manicured gardens. In the evening I tried to find a vegetarian restaurant affiliated with a nearby Buddhist temple but at the listed address there was a Japanese grocery store but no restaurant. 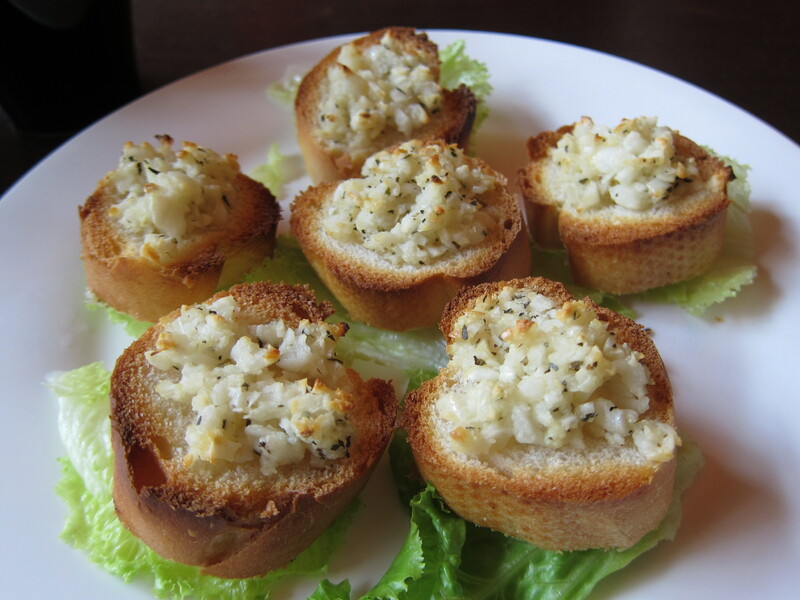 This is some serious garlic bread! 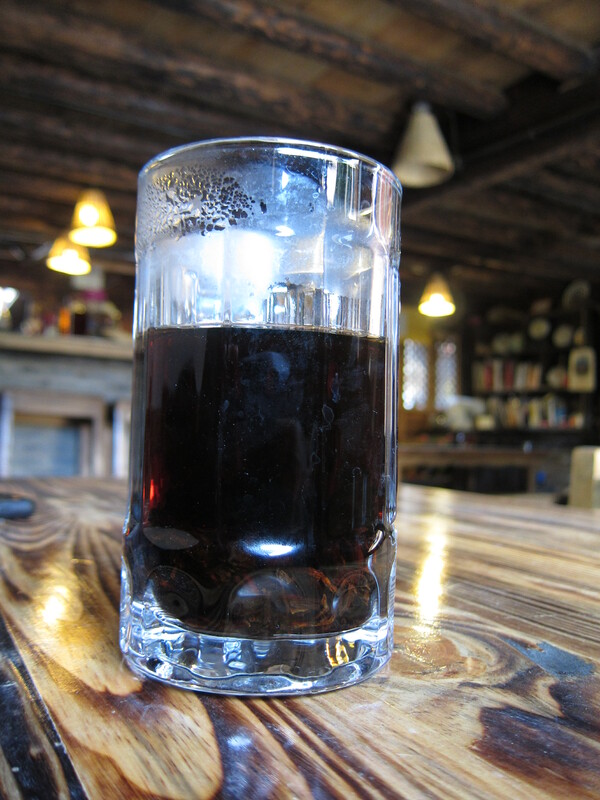 Upland Hostel Bar, Kunming. 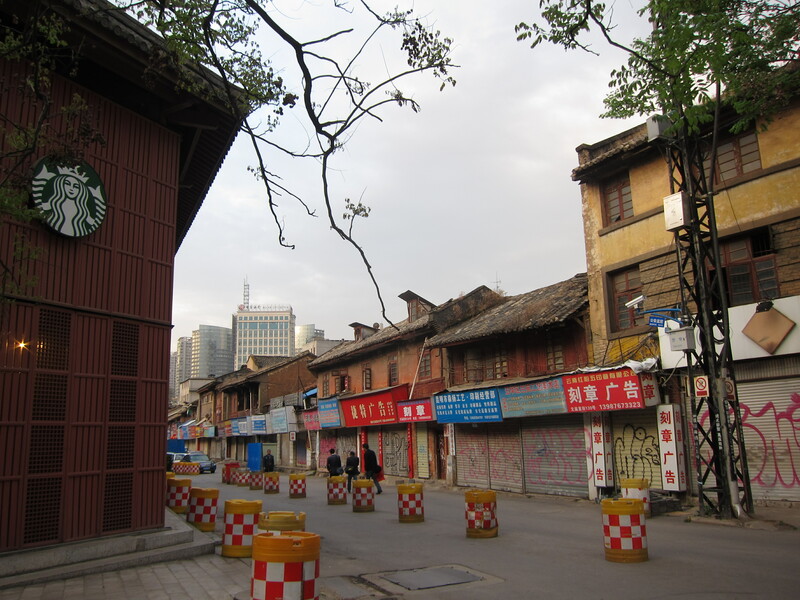 The old and the new, Kunming. Yes, that is a Starbucks on the left. 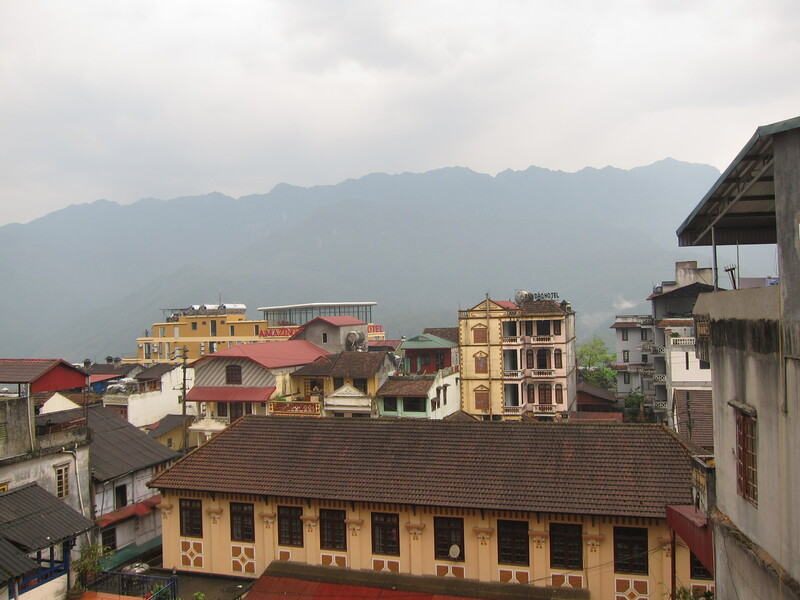 It had been raining since I arrived in Sapa two days ago. 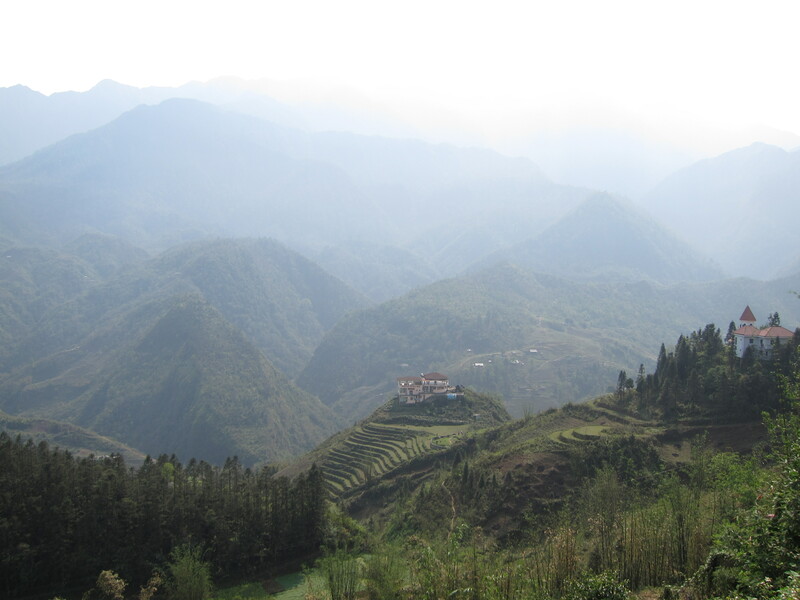 Sapa is in northern Vietnam near the Chinese border, and is a major tourist hub for trekking in the surrounding hills which are populated by various minority tribes, especially the Hmongs. The town is perched on a hillside and offers splendid views of the valley below when the fog clears. 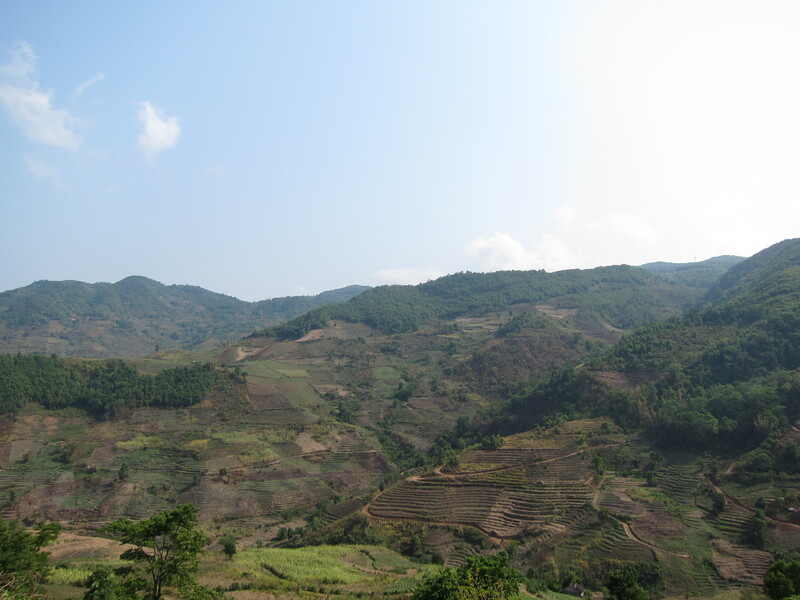 View of the valley around Sapa. Immediately upon alighting from the bus, we tourists were followed down the cobbled streets by Hmong women in traditional dress, aggressively selling their souvenirs and offering to serve as tour guides on treks to their villages. They were skilled businesswomen. They spoke English to me, and it seemed they had also learned to speak enough Chinese and French, among other languages, to engage in basic conversations with tourists. 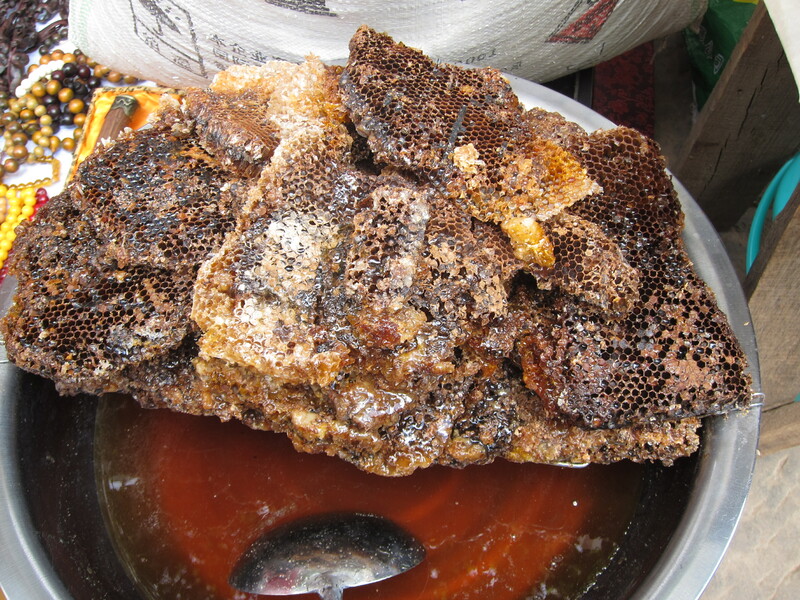 As they followed me down the street, they kept saying, “you buy from me, buy something.” I was worried that I would continually be accosted by these women during my stay in Sapa, but the next day I was left alone most of the time. It seemed they knew who had just come and who had been in Sapa for a while, and they targeted the newcomers as they arrived. I didn’t buy anything from them. 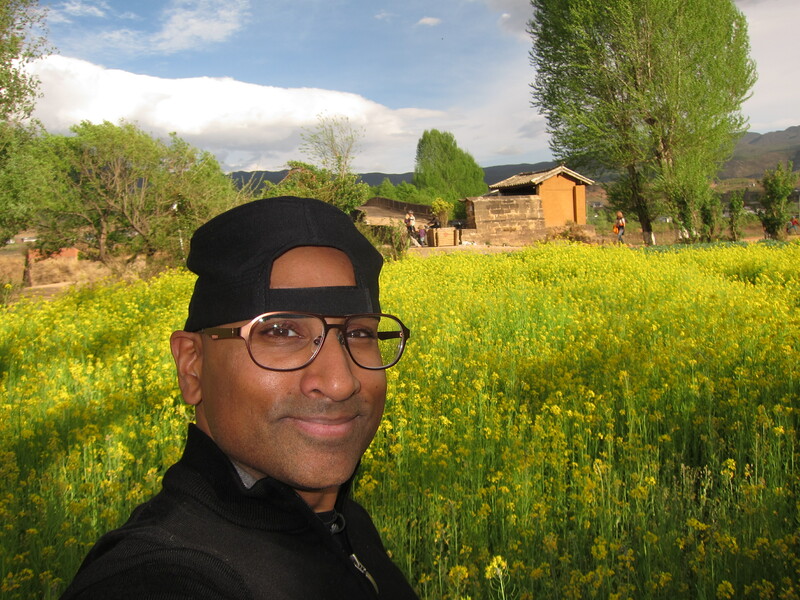 Instead of material items I was more interested in having new experiences, and was particularly looking to do a short trek to the nearby villages. I investigated some tour options with a social welfare organization called Sapa O’Chau (O’Chau means “thank you” in the Hmong language). O’Chau works closely with the local Hmong population, and in addition to coordinating tours they also help Hmong youth access secondary education. Zee, “No. 1 Tour Guide,” as per her card. 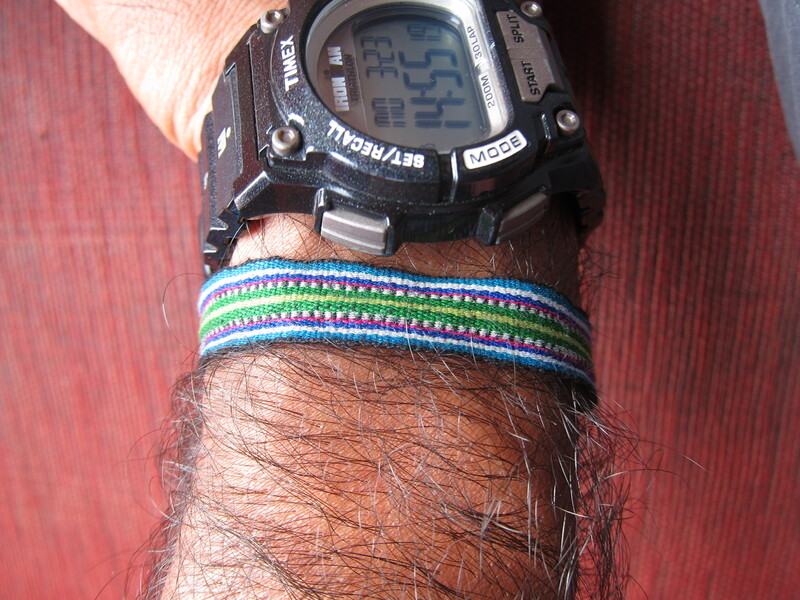 My identifying bracelet, proclaiming my membership in Zee’s entourage. So this morning I met Zee and her 14 year-old daughter, Nying, along with three other tourists who would be joining us for the day. The others were young French women, friends who were spending their vacation together traveling around Southeast Asia. We set out in the cold drizzle. I had a raincoat, umbrella and waterproof shoes, so I felt confident that I would stay fairly dry until the skies cleared in the afternoon, as Zee said was likely. Much of the time we were literally walking through a cloud, and so were unable to see into the valley where our destination lay. Unfortunately the skies did not clear, and instead continued to send down an incessant drizzle that occasionally grew into a downpour. Despite my raingear by mid-day I was soaked from the waist down, and my boots made squishing noises with each step. The Group. (Photo taken by Nying, Zee’s daughter). 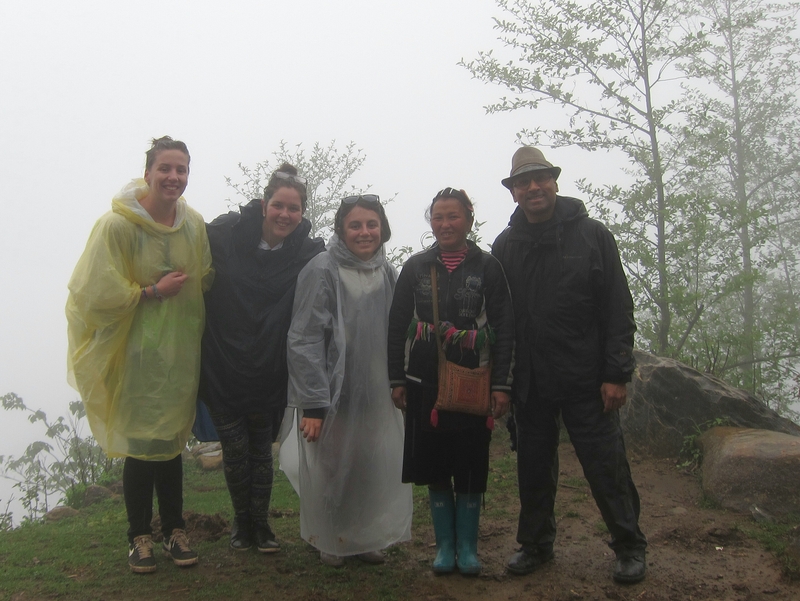 Even with the poor visibility and my wet condition, I enjoyed being in the fresh air and passing through agrarian villages full of various Hmong people identifiable by their traditional garments. We stopped near one of the villages for lunch inside a large shed full of Hmong women and children, including a few babies strapped to the backs of their mothers or older sisters. After lunch we continued walking until we reached Zee’s village in the late afternoon. We met her husband and two other children and had some Vietnamese green tea while drying out near the fire. 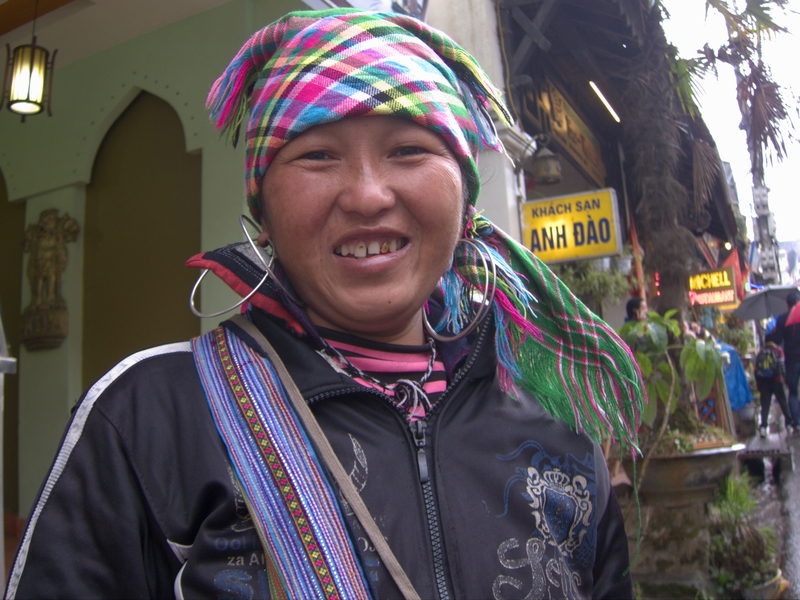 I learned that the family was from the Black Hmong tribe, and that Zee in fact spoke very little Vietnamese. She said her husband spoke more fluent Vietnamese and so could handle any business with the majority Vietnamese population in the area. While she was out selling souvenirs and guiding treks, her husband would manage the household and land and care for the children when they were home from school. There was much work to be done at home, including tending the chickens, repairing and maintaining the wooden structures, and farming the small plot of land where they grew rice and other crops. At the end of the day Zee placed a metal bracelet on my wrist (included as part of the tour, she said), and hailed a Xe Om (motorcycle taxi) for me. I returned to my hotel still quite soaked, but pleasantly tired and thankful to Zee for guiding us on a short adventure, introducing us to her family and showing us the way of life in her village. O’Chau, Zee! 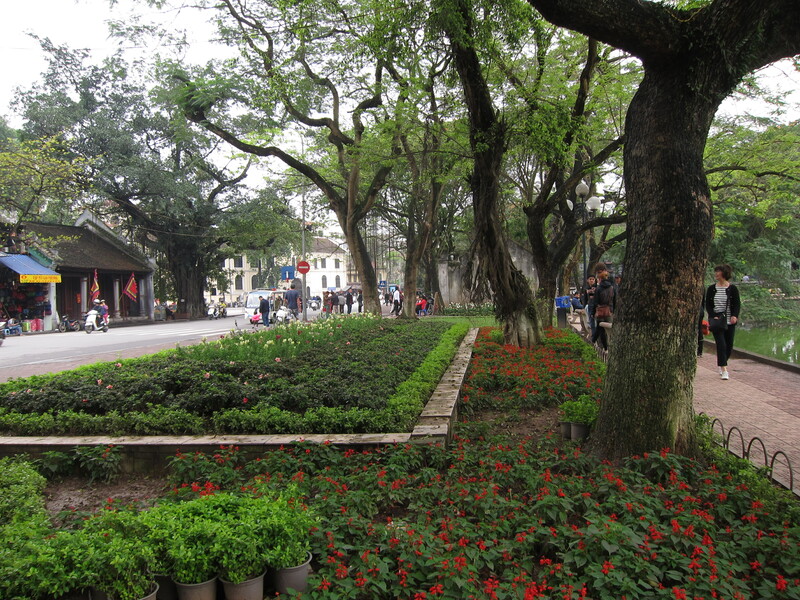 Near Ngoc Son Temple, Hanoi. Bridge to Ngoc Son Temple. 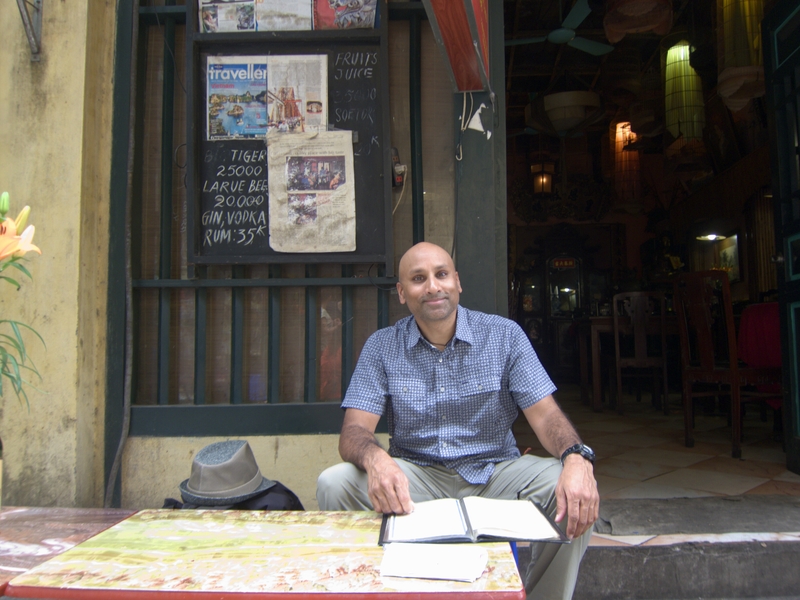 I ended up staying in Hanoi several days longer than I had planned, because obtaining a Chinese visa took longer than I had expected. First, when thumbing through my passport, I found I only had one blank visa page left. Frequently embassies and consulates will not give a visa unless there are at least two blank pages, and I understood the Chinese embassy was quite strict with these rules. So the first order of business was to go to the U.S. Embassy to have more pages added. Three days and $82 later, I had 26 new pages to work with. Restaurant in the Old Quarter, Hanoi. Next I went to the Chinese Embassy to pick up the visa form and review the instructions. 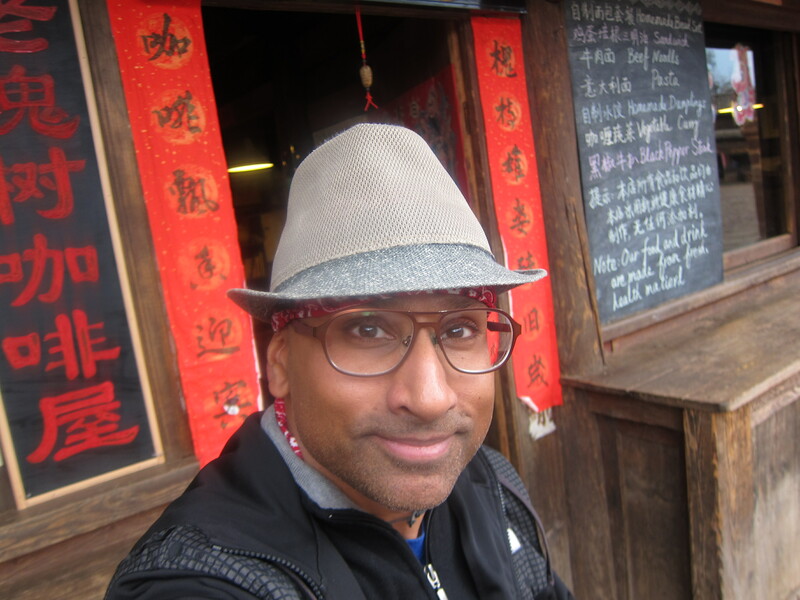 It was one of the longest visa forms I had ever completed (four pages) and they required that I provide proof of travel health insurance as well as copies of my bookings for all the hotels where I would reside during my visit to China. After completing the form and gathering all the needed documents, I went to the embassy to deliver my paperwork, hoping that they would not ask for additional information. I handed the papers to an embassy employee who appeared irritated and a bit hostile. She riffled through my papers quickly. Then she riffled through them again. Next she reviewed each sheet of paper for several seconds, and frequently thumbed back to previous pages to compare the information. She looked up at me smugly and threw the opening salvo. She shoved two papers at me and said, “These bookings are the same.” One point for her. I reviewed the sheets, then said I was sorry, I must have included a duplicate copy. I withdrew one of the pages, carefully folded it up and put it in my pocket with a smile. One point for me. She looked at my papers again, then accusingly thrust two more sheets under the window. “This booking is for three days, this one for seven, same hotel.” One point for her. I courteously explained that indeed the bookings were for the same Kunming hotel, but the bookings were for different dates, since I planned to return to Kunming on my way back to Vietnam. One point for me. Then she fired her victory volley. She held out a sheet of paper as if it were dirty underwear and said with disgust, “What is THIS?” I patiently explained that it was the documentation of my travel insurance, as per the embassy’s visa instructions. One point for me. She put the paper back into the pile. 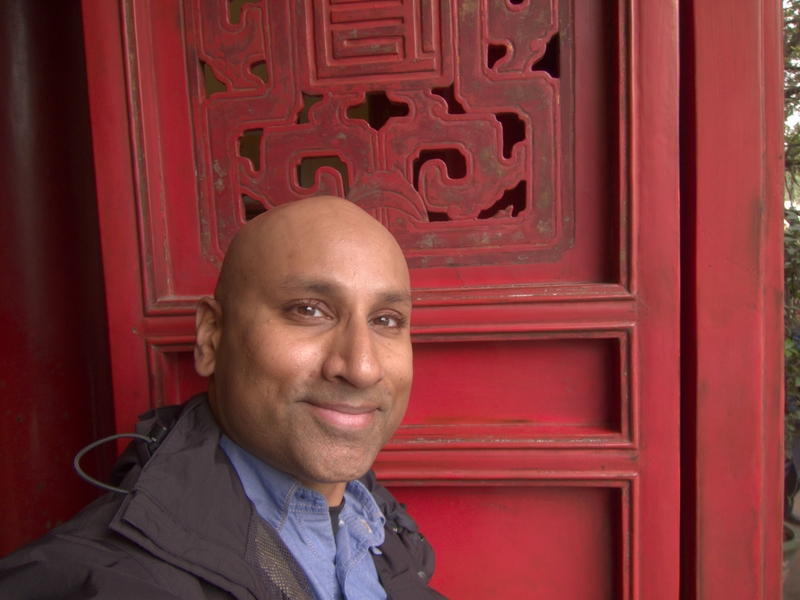 I had only asked for a 30-day single entry visa, but three days later I found they had granted me a ten-year multiple entry visa (as per a new agreement between China and the Obama administration). 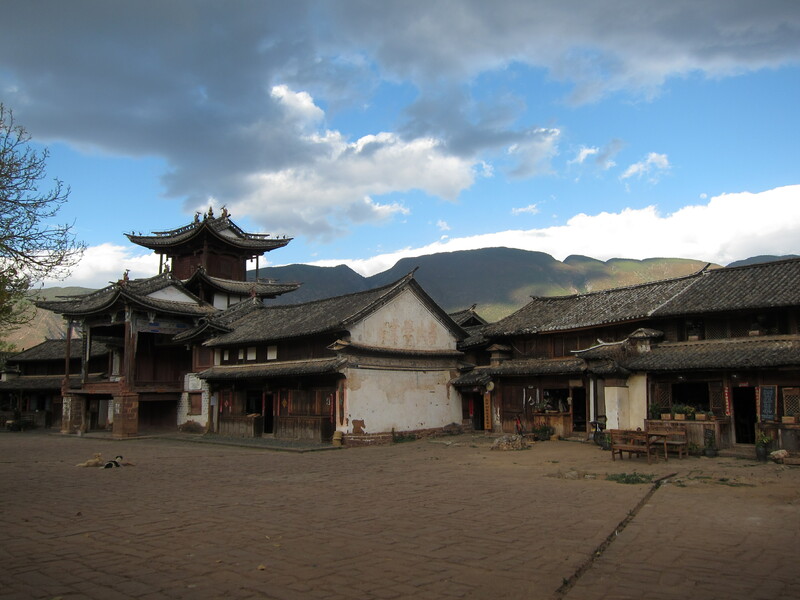 Well, at least I could visit Yunnan province this time. The Legend: In the mid-15th century Heaven sent Emperor Le Thai To a magical sword which he used to drive the Chinese from Vietnam. 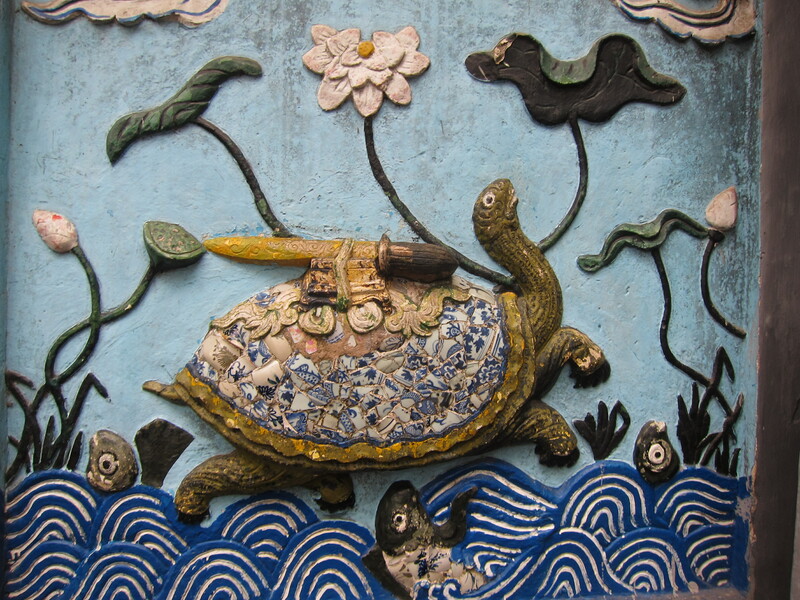 After the war a giant golden turtle took the sword and swam into the lake to restore the sword to its divine owners. 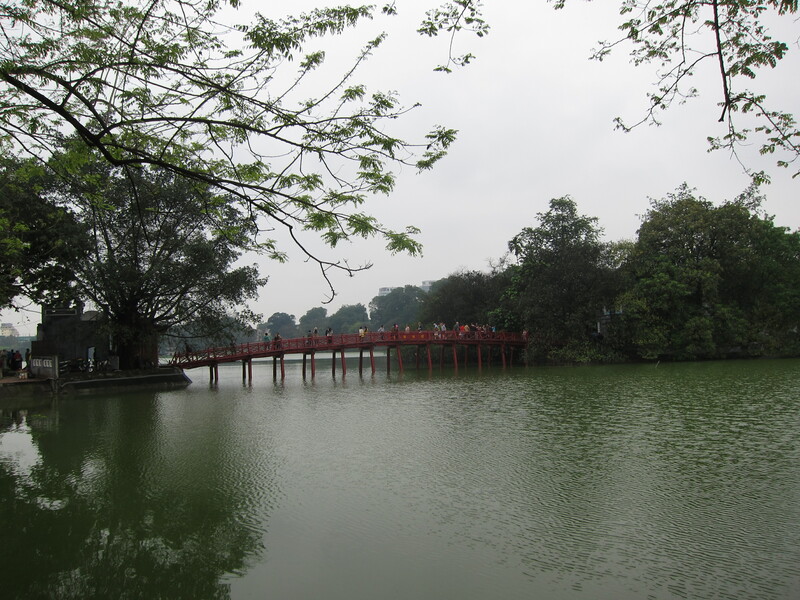 Thus the name Ho Hoan Kiem (Lake of the Restored Sword).